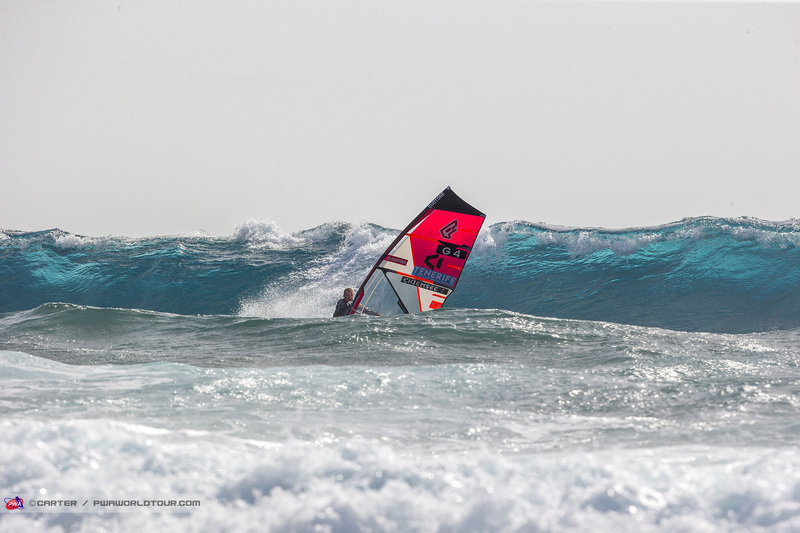 After the sailors registered for the latest wave event - the Tenerife PWA World Cup - they were promptly released with a lack of swell and extremely light winds on offer. And with a much more promising forecast to come from tomorrow onwards the decision was made to call a lay day. 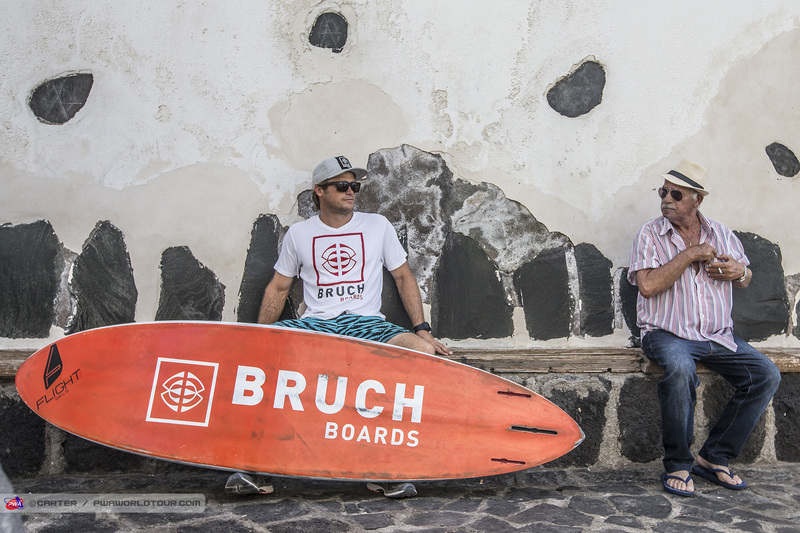 Can you tell us a bit about Bruch Boards and what they are going to bring to the market? “The idea is to have a semi-custom brand, so basically a semi-custom board means that the boards are built in a custom board factory, but there will be an established range. Right now I have two wave board ranges ready. One is with a pintail outline, which is a bit more technical and offers incredibly high performance and then the second one has a square tail, which is much more of an allrounder - which offers excellent plug ’n’ play performance, while still performing extremely well, but it’s easier to just step and go as it is slightly less technical. Literage-wise we’ll be having something around 65l to 105l - (65, 75, 80, 85, 95 & 105l) for both ranges. We will have two constructions available - one full carbon for high performance and the other slightly cheaper glass construction with carbon reinforcements. They will be made in Thailand, but not in the Cobra Factory. It’s a much smaller factory than Cobra and for me it has additional benefits because things are more supervised, they have high quality checks which means the product should be 100% perfect. They work with CNC machines, so everything is directly implemented from the 3D-shaping program. That’s the idea, but then there’s always the option to create something completely bespoke and special if someone wants it. Obviously, the development is not finished yet… I have two ranges for now, but I’m also working on a special wave board, similar to the Black Box, but much better. And how about the logo? 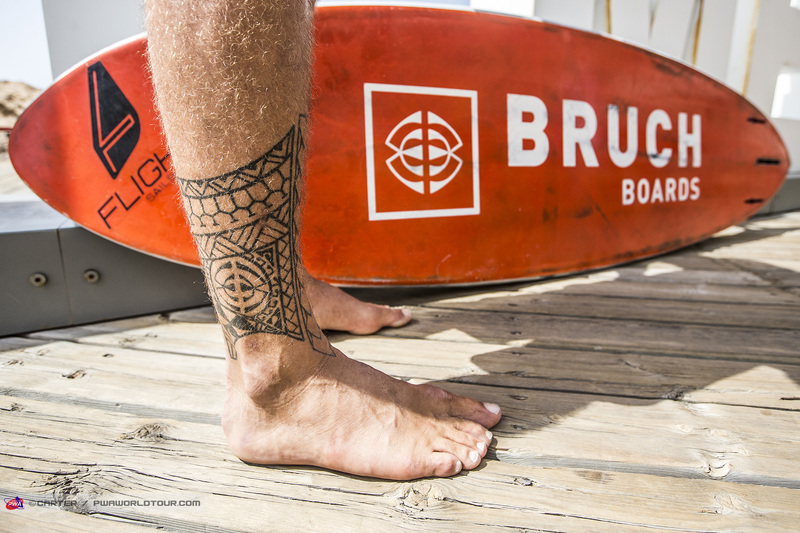 “It’s actually a tattoo that I have on my lower leg / ankle, which means family… so join the Bruch family. 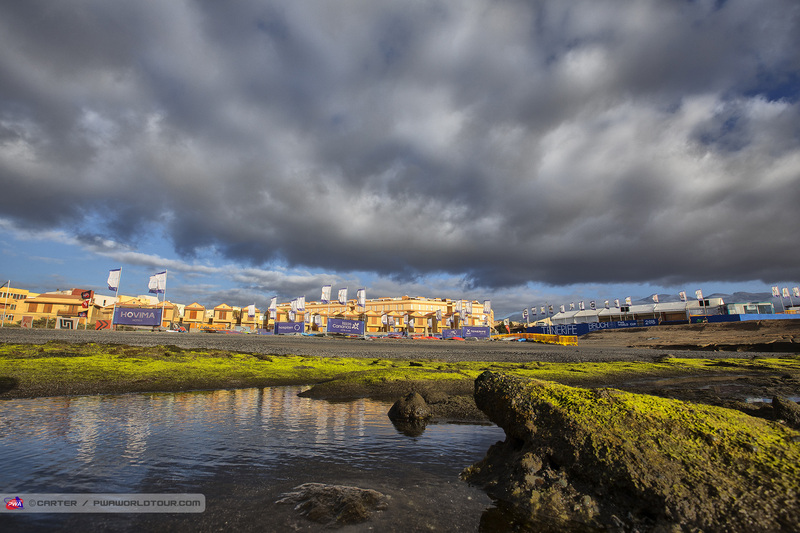 As the organiser of the Tenerife PWA World Cup - excited for the event again this year? What’s your take on how the forecast is shaping up for the week ahead? “It’s looking pretty good now. I had a few sleepless nights last week when the forecast was looking really bad, but thankfully that’s completely changed now and I think it’s looking really good. From tomorrow the wind will start and then from Tuesday onwards I think we could already be on. Even if the wind is slightly lighter than usual, August is never flat, so there will almost definitely be waves around. But usually on this sort of forecast, the wind should accelerate quite a bit from the predicted figures too. Thursday-Saturday definitely looks on with a solid forecast." Anything else you’d like to add about the Bruch boards? “The Bruch Boards website is still under development and we are aiming to have the first boards finalised for December and then start production at the beginning of next year - meaning boards should be available to order around October. For now we’d like to get the name out there and raise the profile of the brand. Thanks, Dany. Good luck for the event and the future with Bruch Boards. The sailors will meet again tomorrow morning for a mandatory skippers’ meeting at 10am with the action commencing from 11:30am (GMT+1) onwards. To stay up to date with all the latest developments from Tenerife — including the live stream, elimination ladders, entry list, images and live ticker simply click HERE and scroll to the bottom of the page. 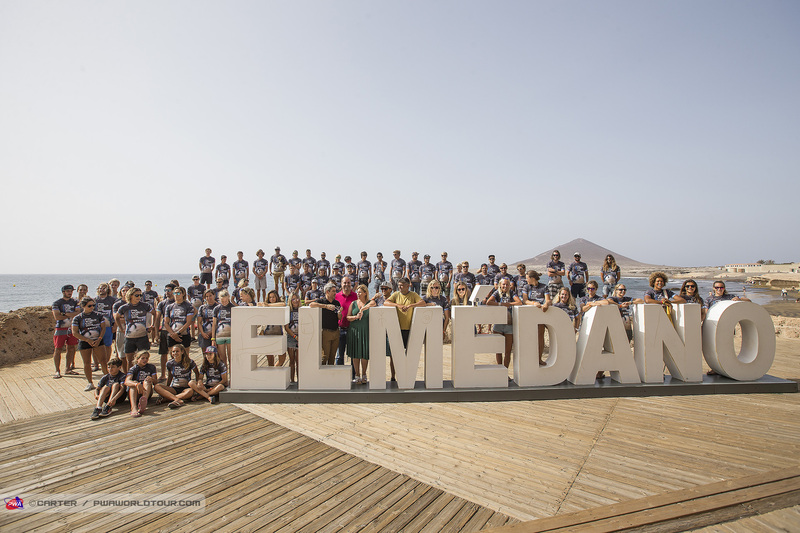 Light southerly winds greeted the competitors on Day 2 of the Tenerife PWA World Cup, which led to the pro fleets being released immediately after the 10am skippers’ meeting - before taking a short walk into El Médano harbour for a group photo. As forecast, the wind switched back to the northeasterly trades during the afternoon, which allowed the opening Youth’s heats of the week to be completed in small waves and winds which increased to around 20-25 knots by the evening. 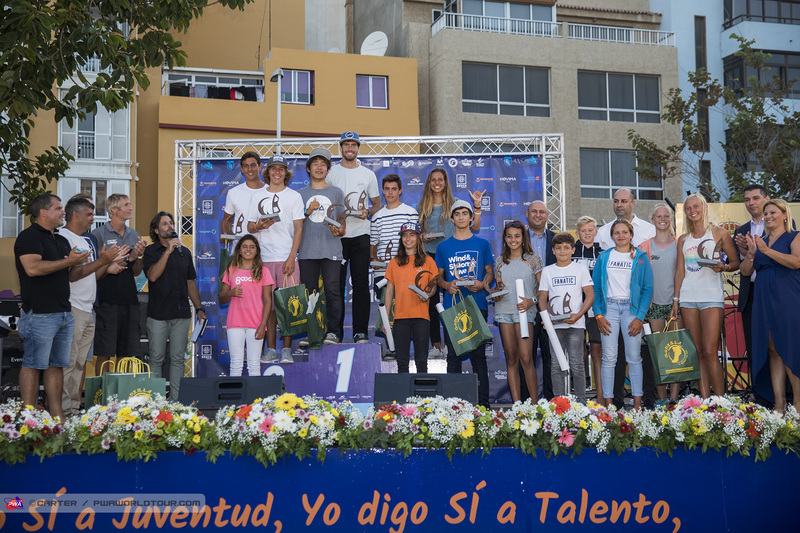 Alexia Kiefer Quintana (Fanatic / Duotone), who won both the U13 and U15 division in Pozo Izquierdo, also won the opening final in Tenerife against Maria Morales (Goya Windsurfing), but it was an incredibly close heat with Kiefer Quintana winning by way of a 2:1 decision. An excellently executed forward loop proving to be the difference. By winning the U13+15 Final, Kiefer Quintana progressed into the U17s division where she would face Mar de Arce (Loftsails) and Julia Pasquale (Fanatic / Duotone). Kiefer Quintana landed another excellent 7 point forward loop, but couldn’t find the wave scores she needed to earn the top spot this time around. Instead, that honour goes to Pasquale with her stylish wave riding proving to be the difference - earning wave scores of 6 and 7.5 points. 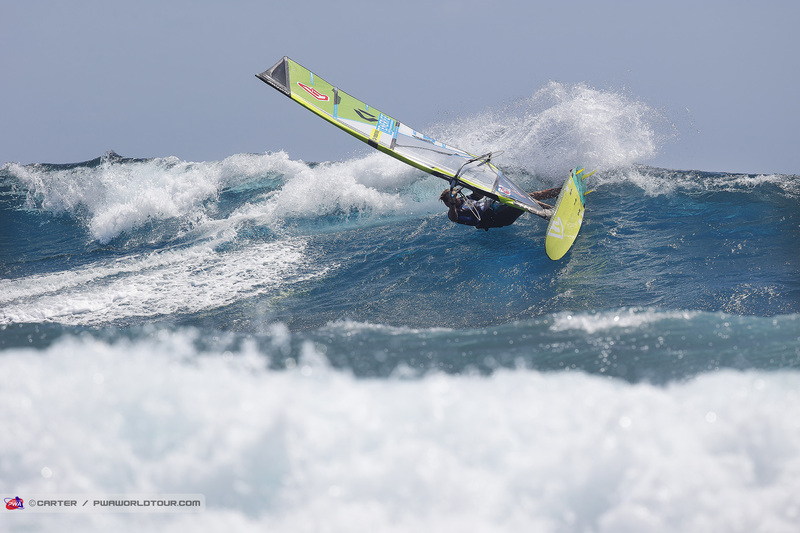 Julia Pasquale, who won the U17 Final went on to win the U20 Final with her wave riding once again impressing! Meanwhile, Tessa van der Meer clinched second place after producing her best wave in the dying seconds, while Coraline Foveau secured 3rd ahead of Nikki van der Meer. Having won the U13s category in Pozo Izquierdo, Tobias Bjørnaa (Fanatic / Duotone) continued that winning form by edging a tight final against Carlos Kiefer Quintana. 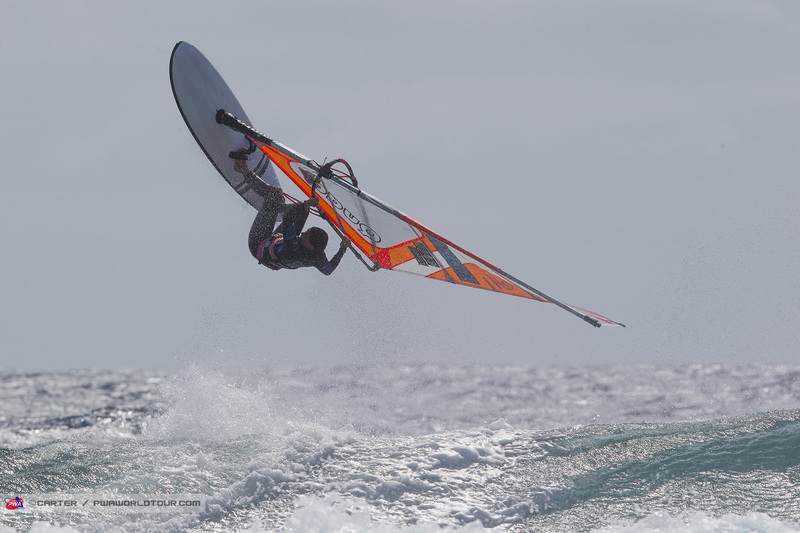 Both landed forward loops, but Bjørnaa executed his slightly better while performing slightly better on the wave. 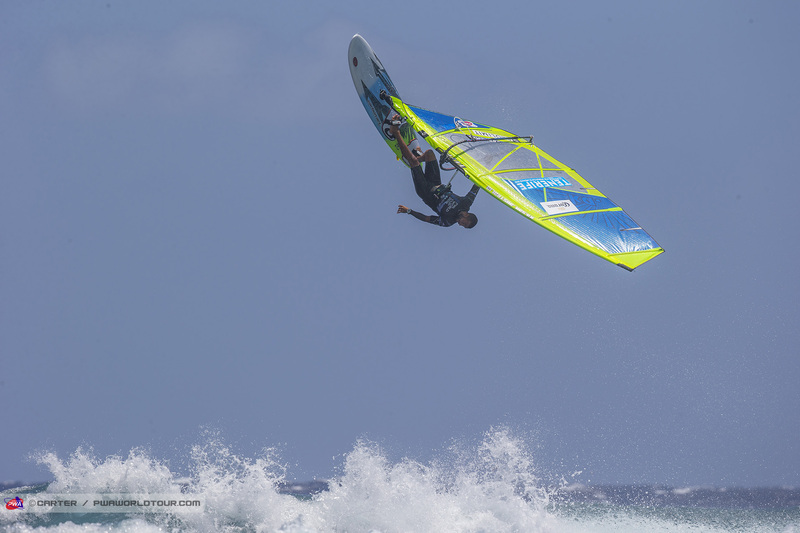 Takuma Sugi (Tabou / GA Sails) stole the show in Heat 1 of the U17s to book his place in the final after landing a fully planing forward, ankle dry backloop and earning two waves in the excellent range. José Casanova Perez (Fanatic / Duotone) and Adrian Artiles Gonzalez will go into the repechage. 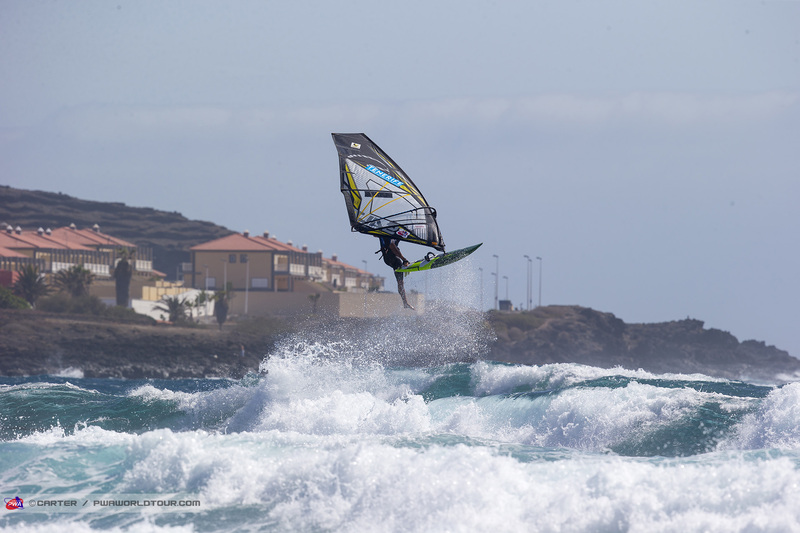 Perhaps unsurprisingly, the top seed in Heat 2 also came out on top - Marino Gil (Goya Windsurfing) - who finished joint 17th in the main draw of the Gran Canaria Wind & Waves Festival. 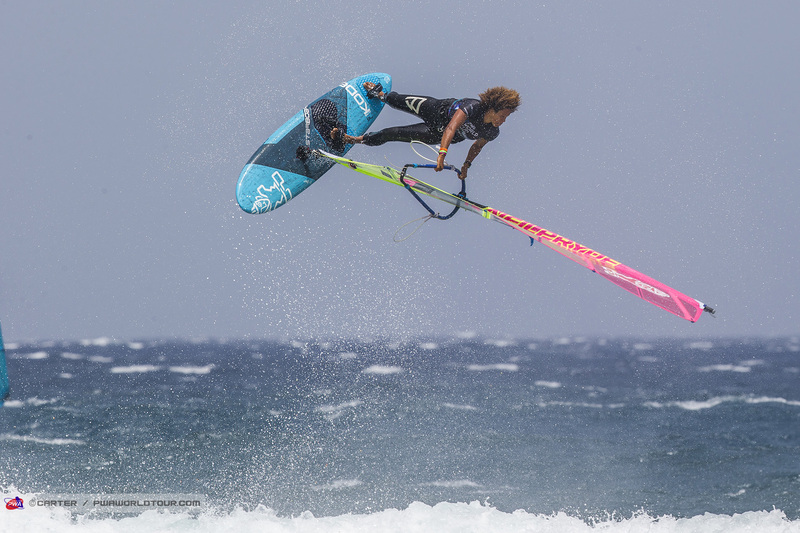 The 15-year-old showed off an impressive repertoire of jumping - a one-handed backloop being the pick of the bunch - while finding a couple of solid wave scores late on - although not in the same league as Sugi’s riding in the previous heat. Mike Friedl (Quatro / Goya Windsurfing) and Leonhard will also go into the repechage where the top 2 out of the 4 sailors will advance into the final. With a better-looking forecast to come the Youth’s were released shortly after 7pm and all fleets will meet again tomorrow morning at 10am for the skippers’ meeting - with the action commencing from 10:30am (GMT+1) onwards. 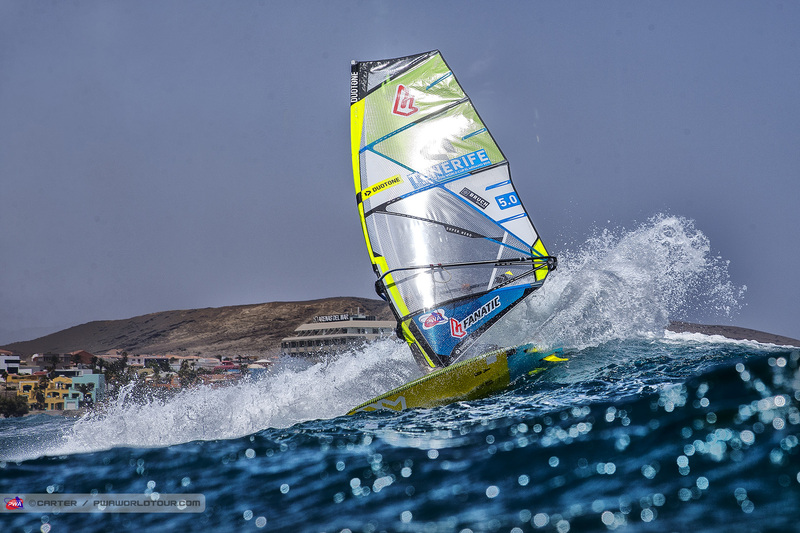 The Youth’s took centre stage again to start Day 3 of the 2018 Tenerife PWA World Cup as strong winds and small waves greeted the sailors. By the end of the day further results were gained in the Boy’s U17 and U20 division, while the Men’s and Women’s Single Eliminations also began before the conditions worsened and the contest was called off in the evening. In the Women’s Single Elimination the opening 7 heats were completed and so far there was no surprised with all the top seeds advancing into the top 8. Sarah-Quita Offringa (Starboard / NeilPryde / Maui Ultra Fins) was the standout sailors as the Aruban posted the highest scoring heat of the day in Heat 9 - 26.88 points - to show that she’s a genuine contender for the title here. 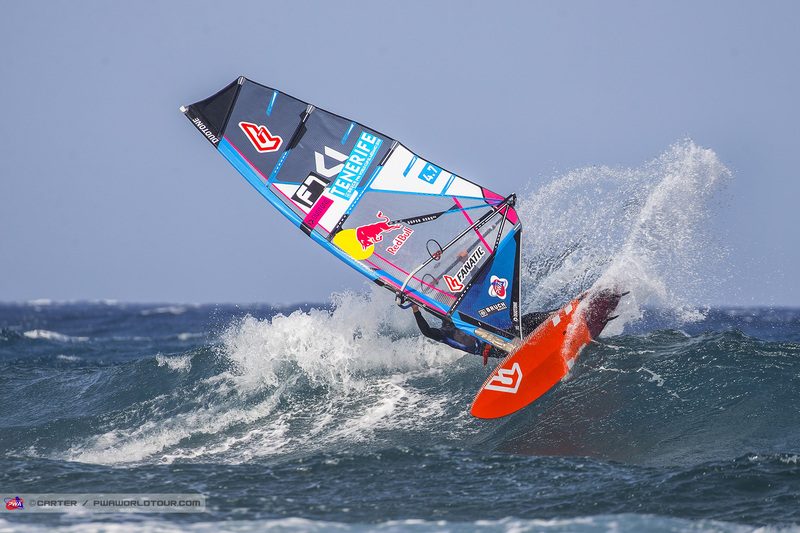 Offringa impressed both in the air and on the wave - landing a stalled forward and a tweaked pushloop, while her powerful wave riding also caught the eye. Meanwhile, Steffi Wahl (Sailloft Hamburg) looked a little out of sync with the waves, but still did enough to defeat - Nicole Bandini (Fanatic / Duotone) - but will know she will need to raise her level against Offringa in the quarterfinals. 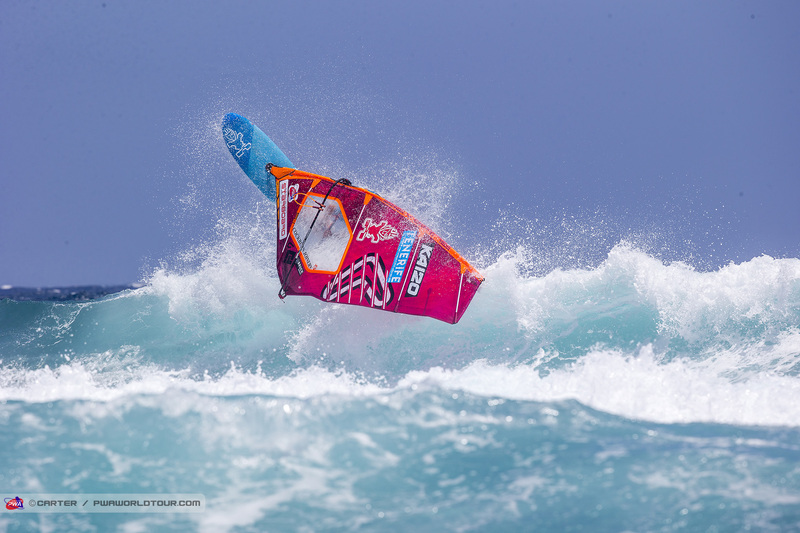 Heat 10 saw Daida Moreno (Starboard / Severne / Maui Ultra Fins) take on Maaike Huvermann (Starboard / Severne / Maui Ultra Fins) and the multiple time proved too much for the Freestyle Vice-World Champion. Daida wasn’t at her deadliest best in the air in the challenging conditions, but produced the highest scoring wave of the day - 8.25 points - after opening with a powerful gauge before landing a frontside aerial. On the a-side Caterina Stenta (RRD / RRD Sails / AL360 / Maui Ultra Fins) came out on top of a close heat against Marine Hunter (KA Sail) to progress. In Heat 11 Justyna Sniady (Simmer / Simmer Sails / AL360) negotiated her way past Serene Zoia (I-99 / Loftsails) after landing a backloop and forward, while showing better wave selection and execution. Lina Erpenstein (Severne / Severne Sails) won the battle of the German’s as she ended the hopes of Caroline Weber (Patrik / Sailloft Hamburg / Maui Ultra Fins). Erpenstein looked good on the wave, but struggled slightly with her jumps and it will be another interesting rematch between herself and Sniady in the quarterfinals. 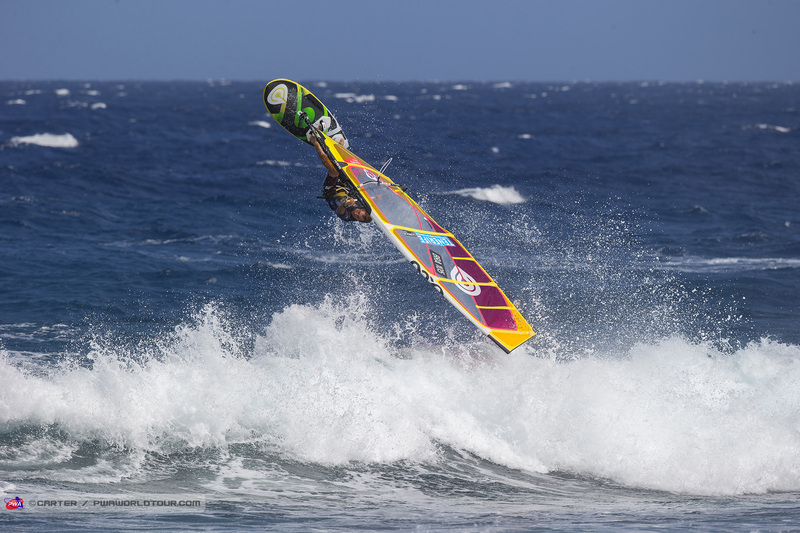 Heat 12 saw reigning world champion - Iballa Moreno (Starboard / Severne / Maui Ultra Fins) - enter the water for the first time and she produced an assured display - landing an almost planing forward loop, while also landing a backloop and attempting a one-foot backie. 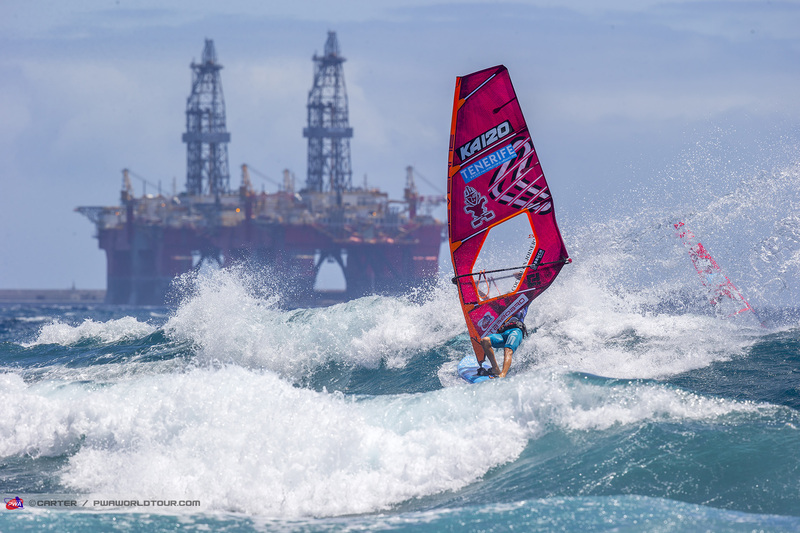 In Pozo, Iballa didn’t look her usual stylish self on the wave, but today her surfy style and flow returned as she linked together vert fluid turns to dispatch of Mar de Arce (Loftsails), who is the youngest girl in the contest as just 14-years-old. Meanwhile, on the b-side Arrianne Aukes (Fanatic / Duotone / Maui Ultra Fins) and Birgit Rieger (Flikka) proved almost inseparable but Aukes edged her way into the quarterfinals by just 0.5 of a point. In the Men’s Single Elimination only the first two heats were completed. In Heat 1 Moritz Mauch (Severne / Severne Sails) looked his usual stylish self on the wave and he successfully booked his place in the second round after defeating Japan’s Takara Ishii, while Jacopo Testa (RRD / RRD Sails / AL360) took down Florian Jung (Starboard / GunSails) with the Italian’s first wave inflicting most of the damage as he blew out the fins on a couple of occasions to earn - 7.12 points. In the only other Men’s heat of the day - Julian Salmonn (Bruch Boards / GunSails) - proved too much for Laurin Schmuth (Goya Windsurfing / Maui Ultra Fins) with the German looking quite comfortable at his home break. On the other side of the heat - Loick Lesauvage (Goya Windsurfing) - was able to end the hopes of fellow Frenchman Alexandre Grand-Guillot (Fanatic / Duotone) after posting a heat total of 21.76 points. Takuma Sugi (Tabou / GA Sails), who was the standout sailor in the U17s yesterday, continued that form today to win the final - impressing again with his dynamic wave riding, while also reading the wave well in the some times tricky conditions. 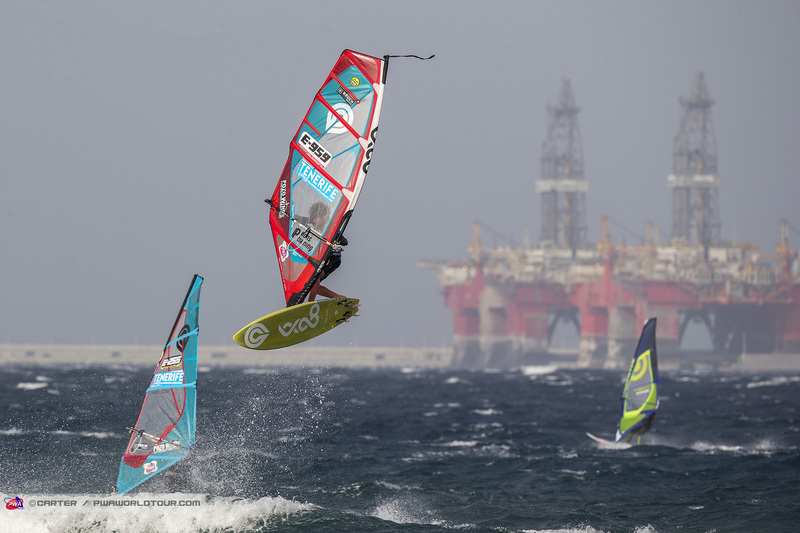 That meant that Marino Gil (Goya Windsurfing) had to settle for second place, while José Casanova (Fanatic / Duotone) completes the podium ahead of Adrian Artiles (Goya Windsurfing / Simmer Sails), who finishes 4th. 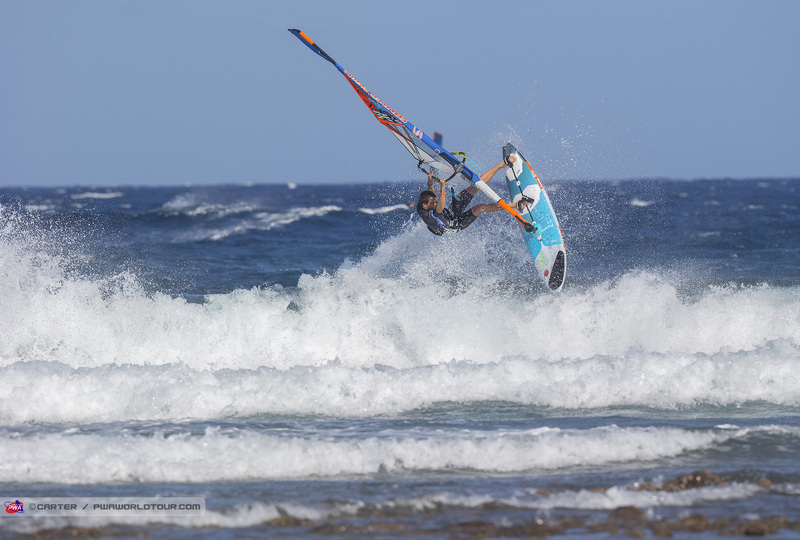 Noah Vocker (Fanatic / Duotone / Maui Ultra Fins) and Valentino Pasquale (Fanatic / Duotone) rightfully earned their places in the Winners’ Final after producing a series of impressive displays. En route to the final both sailors impressed with both unleashing powerful turns and takas on the waves and at times it was quite difficult to tell the difference between them on the wave as they both have quite a similar style. However, in the final it was Vocker who produced the better performance as he outscored his opponent both wave riding and jumping. 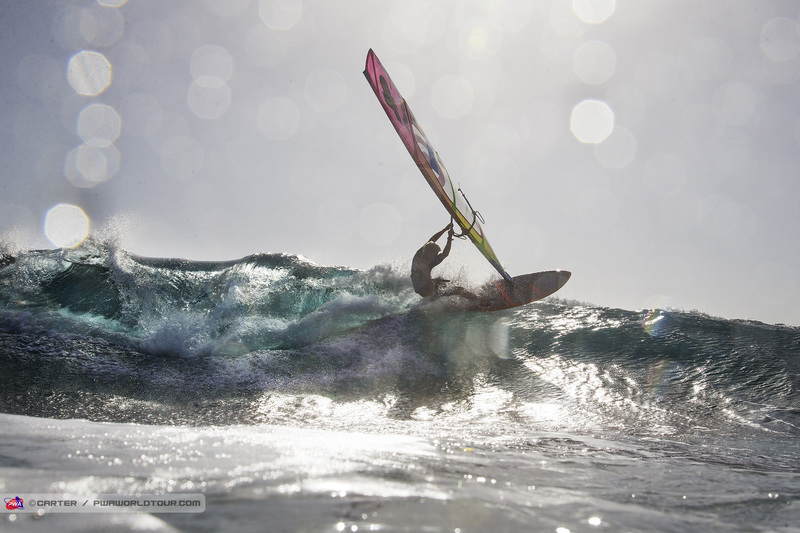 The 18-year-old landed a tabletop forward, one-handed backloop and sailed away from a wet double forward, while earning two wave scores of 6 and 6.5 points to earn the top spot on the podium. Meanwhile, Baptiste Cloarec (Severne / Severne Sails) completes the podium after defeating Adam Warchol (Quatro / Goya Windsurfing). You can see a list of the Youth’s results by clicking here. The sailors were released at 6pm with the wind become lighter and more gusty, while the waves also dropped in size and quality. All fleets will meet again tomorrow morning for the skippers’ meeting at 8:30am with the action commencing from 9am (GMT+1) onwards. 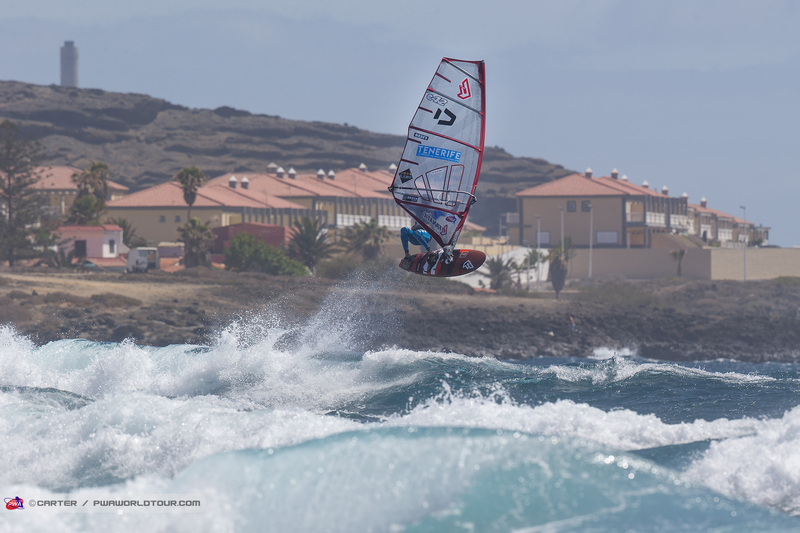 Day 4 of the 2018 Tenerife PWA World Cup proved to be a little bit frustrating with a solid swell running in the morning, but very light winds, while in the afternoon the wind picked up, but the swell quickly dropped. However, progress was still made in the Men’s Single Elimination with all but one heat in the second round now completed. Meanwhile, the Women’s fleet remained on hold for the day. The opening two heats of the day - Heat 3 and 4 - saw by far the best conditions of the day with both wind and waves. Gollito Estredo (Fanatic / Duotone) looked incredibly dangerous in Heat 3 - landing a planing double forward to dispatch of Miguel Chapuis (JP / NeilPryde), while Kenneth Danielsen (Flikka / Simmer Sails) and Martin ten Hoeve (Simmer / Simmer Sails) enjoyed a close fought battle. However, in the end, it was ten Hoeve who came out on top after landing a frontside 360 off of a bowly section to earn 8.5 points. However, both Gollito and ten Hoeve were then eliminated in the second round. The rest of the first round went pretty much according to plan with no real upsets taking place. 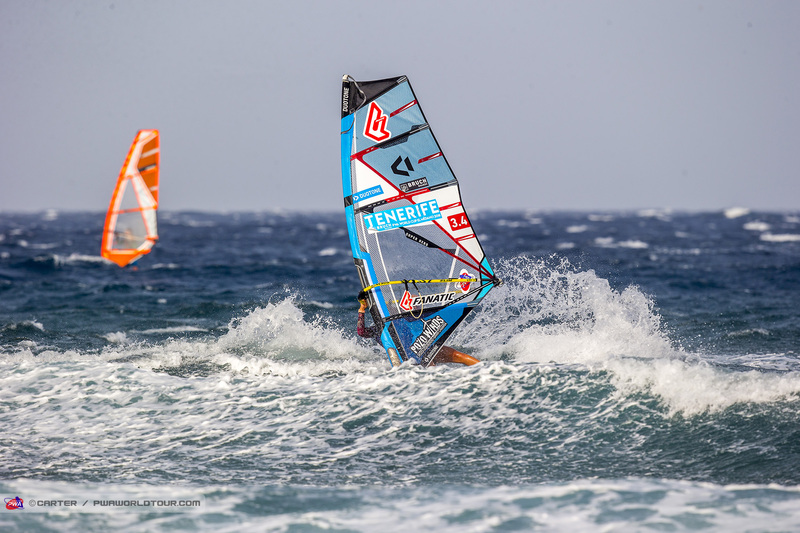 After a short break, the second round began and both Jaeger Stone (Starboard / Severne / SWOX / Shamal Sunglasses) and Moritz Mauch (Severne / Severne Sails) safely progressed from Heat 9 at the expense of Camille Juban (Quatro / Simmer Sails) and Jacopo Testa (RRD / RRD Sails / AL360). Both Stone and Mauch looked their usual stylish and explosive selves on the wave - both blowing out the fins on several occasions. They will now face each other in the last 16. Heat 10 saw fireworks, but more after the heat had finished with Antoine Martin (NeilPryde) extremely disgruntled that he had been adjudged to have lost against Julian Salmonn (Bruch Boards / Gun Sails). However, to be fair to Salmonn he produced the more powerful wave riding, which was rewarded. 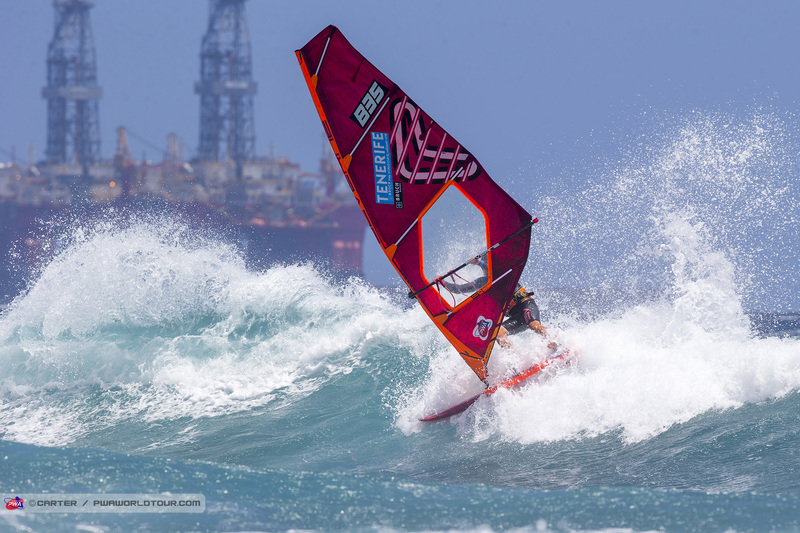 On the b-side Marcilio Browne (Goya Windsurfing) faced Loick Lesauvage (Goya Windsurfing / Shama Sunglasses) and while the Brazilian may not have been at his absolute best today he still had too much firepower for 18-year-old. 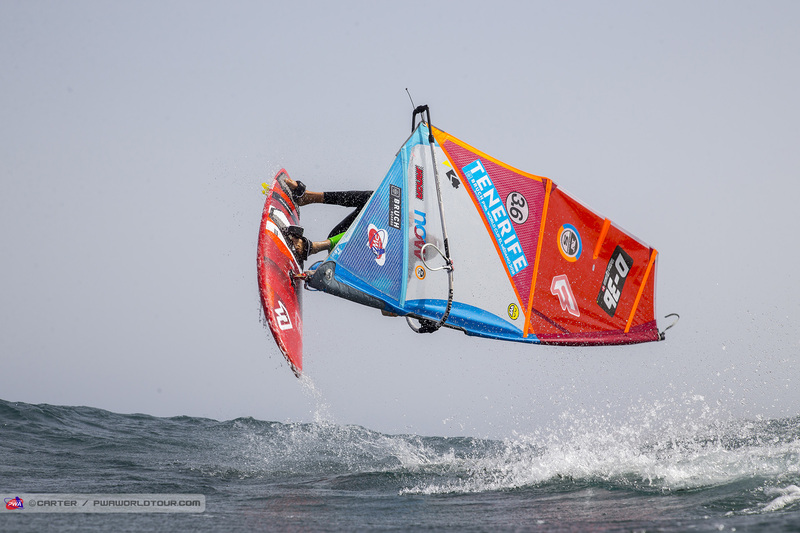 Marc Paré (Simmer / Simmer Sails) was the man to end Gollito Estredo’s hopes in Heat 11 with the 20-year-old really catching the eye with his wave riding - earning counting waves of 6.62 and 8.12 points. 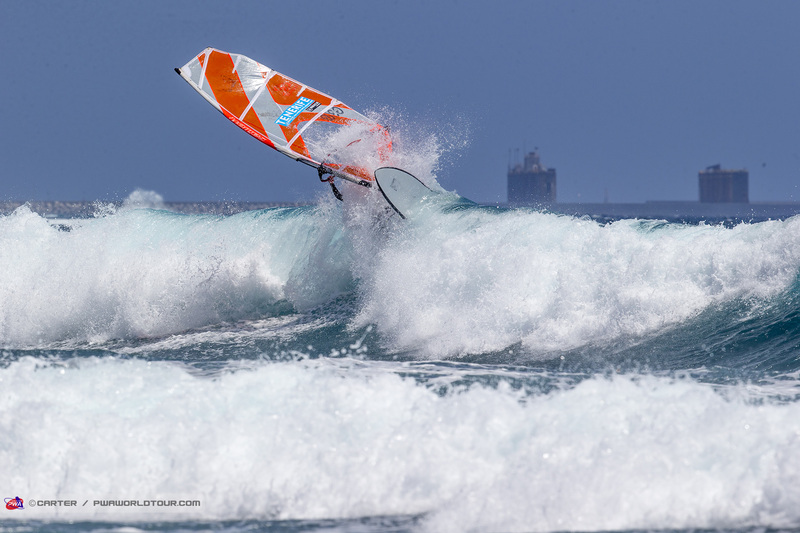 Paré will now face Thomas Traversa (Tabou / GA Sails), who came into Tenerife off of the back of his worst result in 8 years, but looked much more like his normal self today with several free-flowing, effortless looking waves. Vice-world champion - Victor Fernandez (Fanatic / Duotone / Shamal Sunglasses) - was one of the standouts as he made the most of the conditions on offer in Heat 12. 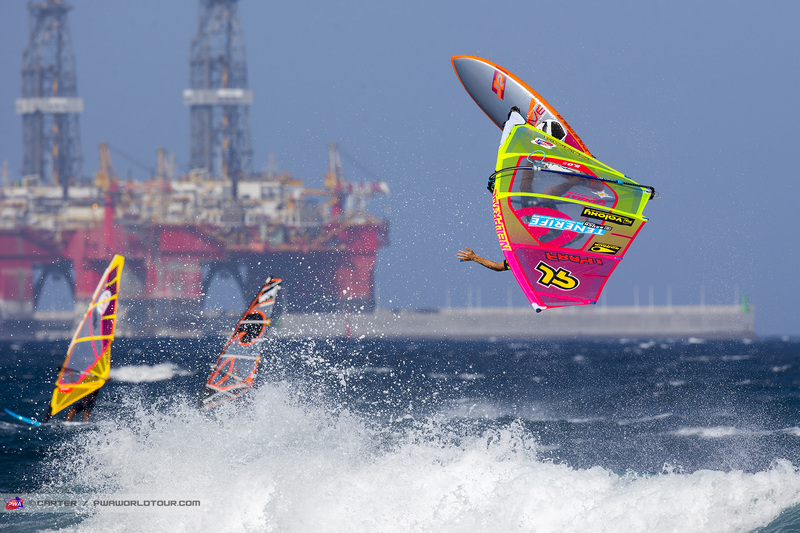 Landing a perfect double forward while also landing two frontside aerials on one wave to defeat Dario Ojeda (Flikka / Challenger Sails). The Spaniard will now face good friend and teammate Klaas Voget (Fanatic / Duotone) after the German defeated Omar Sanchez (Carbon Art / KA Sail). Adam Lewis (Fanatic / Duotone) was one of the other standouts today in the small conditions as the Brit consistently delivered some of the most powerful hacks of the day to defeat 15-year-old Marino Gil (Goya Windsurfing). Lewis will now go up against Josep Pons (Simmer / Simmer Sails) for a place in the quarterfinals after Pons scraped through an unspectacular heat on the b-panel of Heat 13 - where he sneaked past Aleix Sanllehy (Tabou / GA Sails). Lewis won’t underestimate Pons, as he is one of the best jumpers in the world, but Pons will know he will need to raise his game significantly in order to progress. In Heat 14 Jules Denel (JP / NeilPryde) took down Dieter van der Eyken (Severne / Severne Sails) with a cleanly landed one-hand backloop and some excellent wave riding - with the pick of the bunch consisting of 4 aggressive frontside snaps. Meanwhile, local legend Alex Mussolini (RRD / RRD Sails) successfully progressed past a potentially tricky opponent - when facing U20 champion - Noah Vocker (Fanatic / Duotone / Maui Ultra Fins). Mussolini will be pleased to have made it through today and will no doubt be looking forward to tomorrow’s conditions which are anticipated to be much better. Due to some issues with the jet-ski, Heat 15 proved to be the final heat of the day and event organiser Dany Bruch (Bruch Boards / Flight Sails / AL360 / Shamal Sunglasses) successfully overcame Arthur Arutkin (Fanatic / Duotone), who had looked very impressive in the first round. Bruch will now face Ricardo Campello (Brunotti Boards / Point-7), who looked on song - landing a double forward and a sick frontside 360 off of a nice section to end the hopes of Morgan Noireaux (JP / S2Maui). That means that the first heat up tomorrow morning will be Men’s Heat 16, which will see a massive heat between teammates - Leon Jamaer (JP / NeilPryde) and Robby Swift (JP / NeilPryde / SWOX), while Ben Proffitt (Simmer / Simmer Sails) will face a tough task against Philip Köster (Starboard / Severne / Maui Ultra Fins). On paper tomorrow should be the best day of the contest - conditions-wise - and with that in mind the skippers’ meeting has been called for 08:30am with a first possible at 9am (GMT+1). 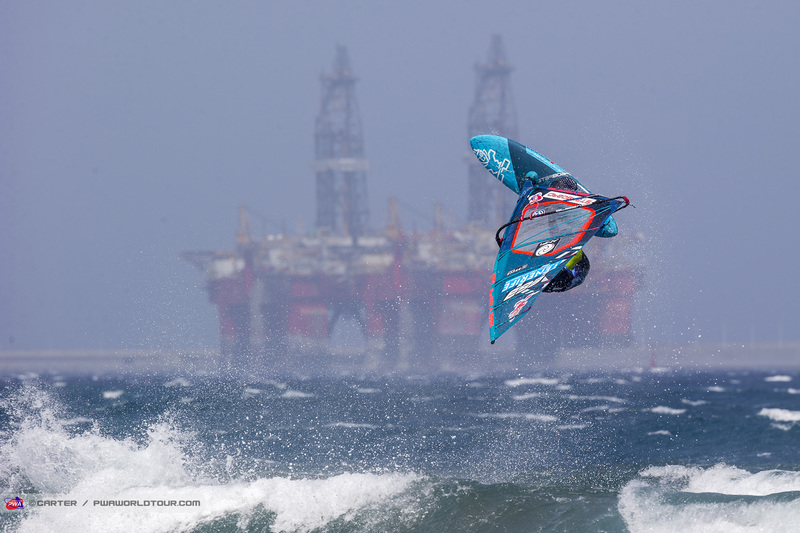 Don’t miss any of what should be an enthralling day of action by tuning into www.pwaworldtour.com. 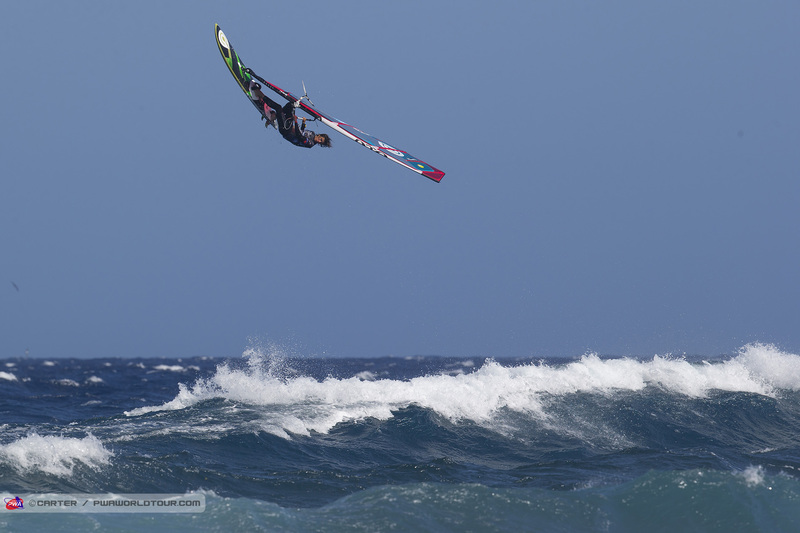 Day 5 of the 2018 Tenerife PWA World Cup produced the best day of action so far as waves up to logo high, during the morning and early afternoon, plus stronger winds than yesterday allowed the Men’s and Women’s Single Eliminations to be completed - although unfortunately the finals didn’t quite live up to expectations with the conditions slackening off just at the wrong time. Iballa Moreno (Starboard / Severne / Maui Ultra Fins) has won the Tenerife PWA World Cup for the last two seasons and today the reigning world champion took a step towards completing a hat-trick of event victories here by taking down the single elimination by defeating Sarah-Quita Offringa (Starboard / NeilPryde / Maui Ultra Fins) in the final. 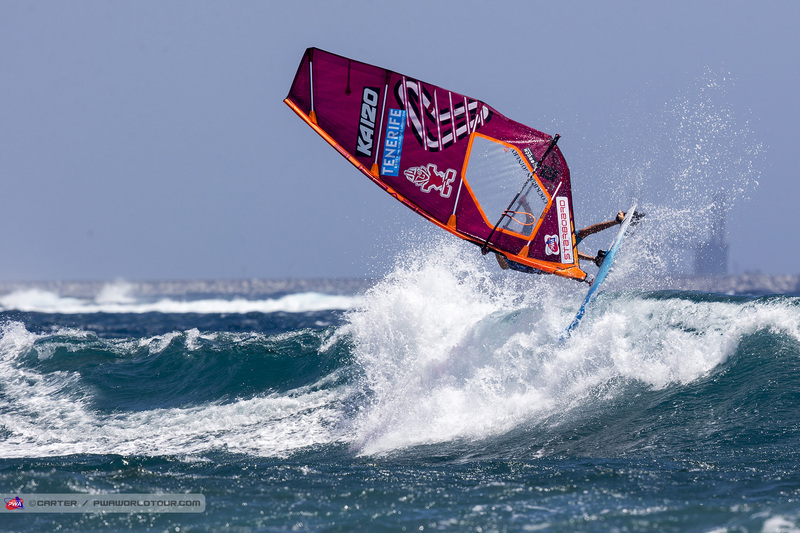 The final itself didn’t have the best conditions with the wave quality dropping, but even so Iballa made the most of the conditions on offer to land a high clean backloop - 6.5 points - while impressing with her fluid wave riding once again to earn the top spot on the podium. Offringa ends the day in second place - just like last year - and although the Aruban earned the highest single wave score in the final - 6.75 points, which was half a point better than Iballa’s highest - Offringa couldn’t find the second wave score or better jump that she needed to trouble Iballa on this occasion. However, Offringa has looked more dangerous than ever at this event and you wouldn’t bet against her in the double if the forecast allows it to be completed. Daida Moreno (Starboard / Severne / Maui Ultra Fins) won’t be happy with having to settle for 3rd place in the double elimination - after narrowly losing out to Offringa in the semifinals. Both women landed excellent jumps - a high backloop for Daida and an almost planing tweaked pushloop for Offringa - but both struggled on the wave with their respective highest wave score being a lowly 3.38 points. Daida then made no mistake in the battle for third and 4th against - Justyna Sniady (Simmer / Simmer Sails / AL360) - as she quickly racked up 20.81 points in the first few minutes, while also attempting a double forward. Expect to see Daida on the charge in the double - if given the chance. 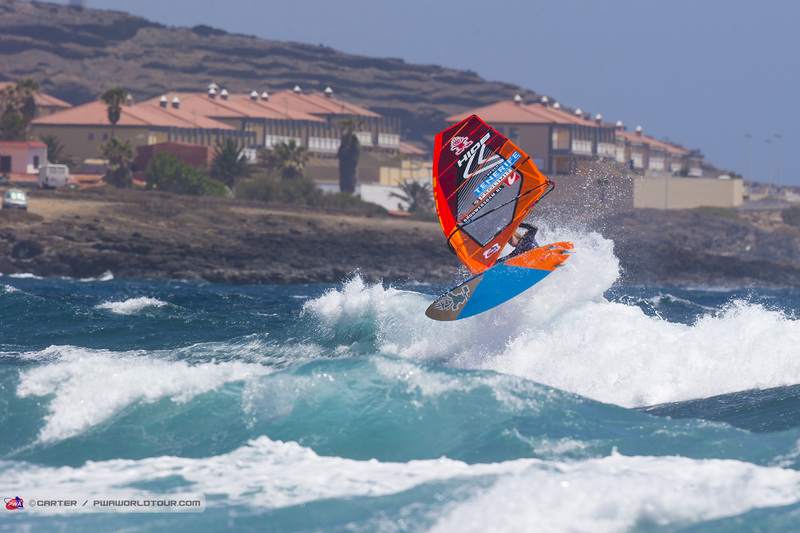 Justyna Sniady, meanwhile, was delighted to earn an excellent 4th place in the single elimination - just as she did in Pozo Izquierdo - which is also her best result in Tenerife (in a single). 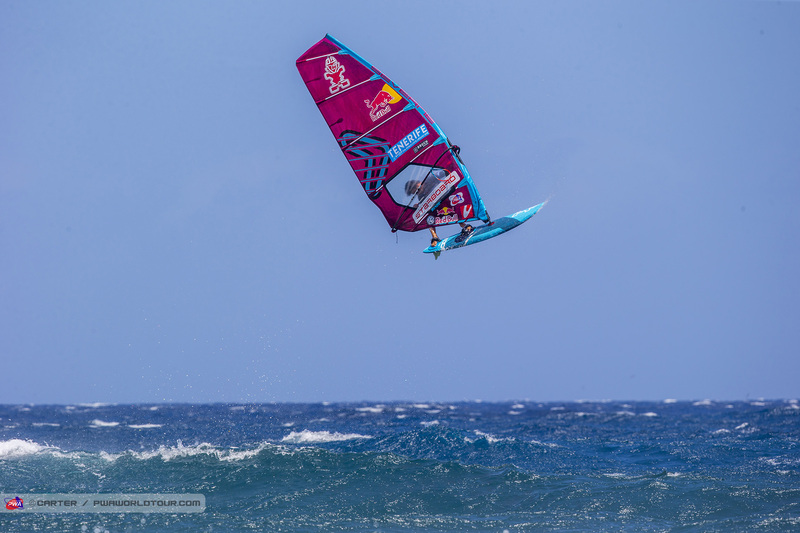 The Pole will be delighted to have gained the upper hand against Lina Erpenstein (Severne / Severne Sails) again and sailed well throughout landing big clean backloops, while looking smooth and consistent on the wave. Lina Erpenstein has to settle for joint 5th place in the single alongside Caterina Stenta (RRD / RRD Sails / AL360 / Maui Ultra Fins), Arrianne Aukes (Fanatic / Duotone / Maui Ultra Fins) and Steffi Wahl (Sailloft Hamburg). Any thoughts that - Victor Fernandez (Fanatic / Duotone / Shamal Sunglasses) - may have been rattled, having missed out on the podium in Pozo Izqueirdo for the first-time in 11 seasons last month, were firmly dispelled today as the vice-world champion produced his usual slick and almost faultless display to return to winning ways in the single elimination. 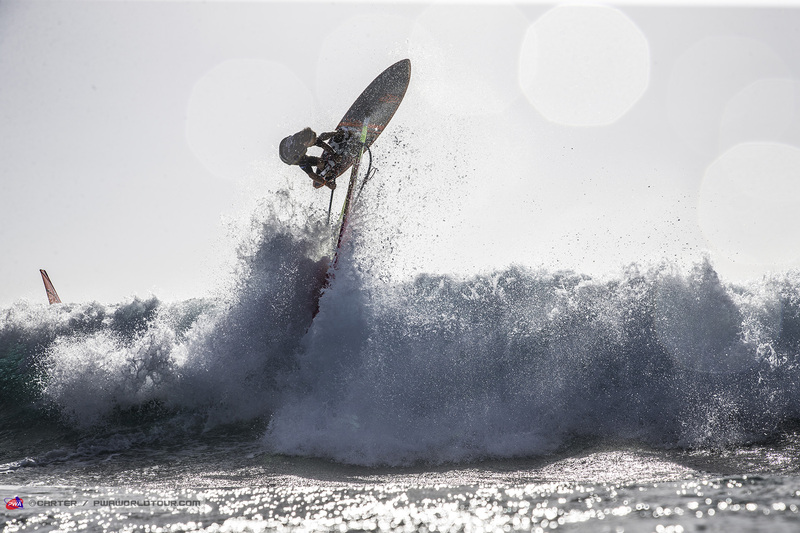 Fernandez landed perfect doubles and a stalled double, while showing excellent variety on the wave to come out on top and made the most of the quite poor conditions in the final. With the way the rest of the results worked out today, if things were to remain as they are at the moment, then Fernandez would assume control of the title race in a total change of events. Adam Lewis (Fanatic / Duotone / SWOX) was in inspired form today as the Brit qualified for his first Winners’ Final on the world tour - which guarantees him a first podium whatever happens. 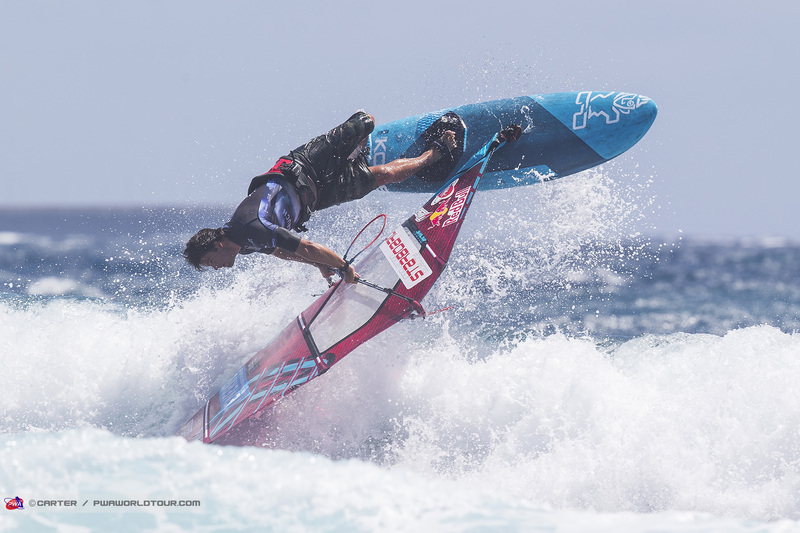 The 30-year-old produced the highest scoring heat of the contest so far - 24.88 points - to defeat Ricardo Campello (Brunotti Boards / Point-7) in the semifinals. Lewis was one of the standout sailors yesterday with his explosive wave riding catching the eye, and his wave riding was a cut above again - earning the first 10 point wave of the contest with a sick frontside 360 off of a pitching section before backing it up with a solid cutty. It then looked as though Lewis may earn a perfect wave heat score as he pinged another frontside 360, but his back up turn ended a little bit messy - 8.93 points. 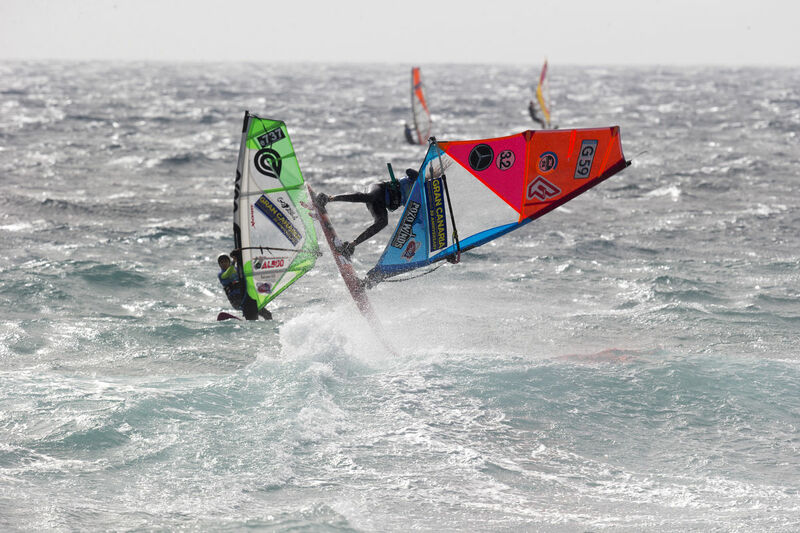 Lewis will perhaps be a bit gutted with the conditions in the final as the waves had backed off and there were none of the bowly sections that he had been hitting against Campello and he struggled to find scoring opportunities - while he couldn’t find a ramp for a decent jump. However, he will still be delighted with today’s performance and result. 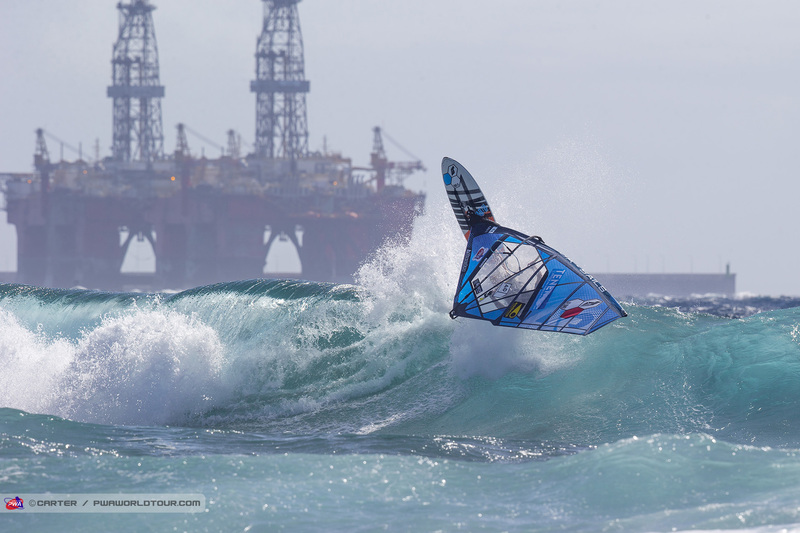 Having taken down Philip Köster (Starboard / Severne / Maui Ultra Fins) in the quarterfinals, Ricardo Campello may have felt that today was going to be his day. However, he met the aforementioned, Lewis and there wasn’t much he could do. The 33-year-old produced a solid enough display in the semifinals but was powerless to stop the Brit on this occasion. 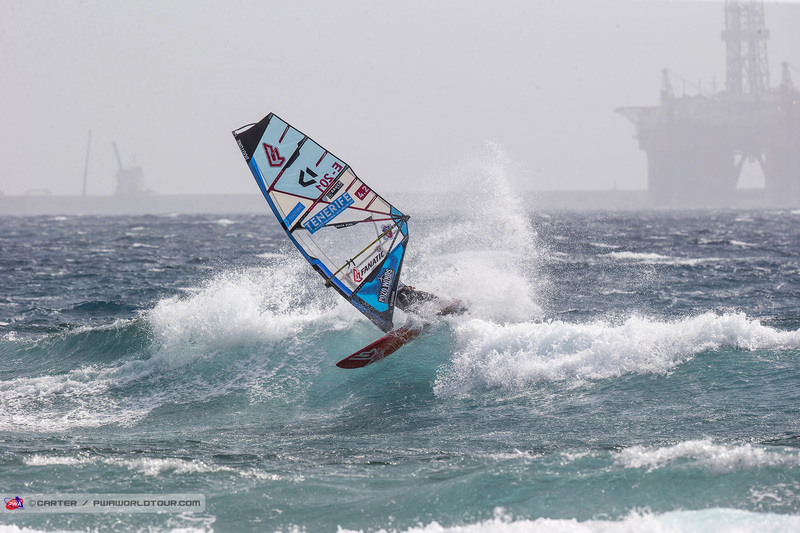 Campello then won the battle for 3rd against Jaeger Stone (Starboard / Severne / Shamal Sunglasses), but will be eager to try and climb higher in the double elimination in order to not lose ground o,n the title race. Jaeger Stone finishes 4th for the single elimination and for a while it looked as though he may go further than that after defeating Moritz Mauch (Severne / Severne Sails) and Marcilio Browne (Goya Windsurfing) with two fine performances. However, the Australian then went slightly off the boil at the crucial moments. Stone is now guaranteed to better any of his results from last season with the worst he can finish being 5th - but he’ll be looking up rather than down. Neither of the world’s current top 2 - Philip Köster and Marcilio Browne) made it into the top 5 on a day which saw a bit of a mix up in the results. 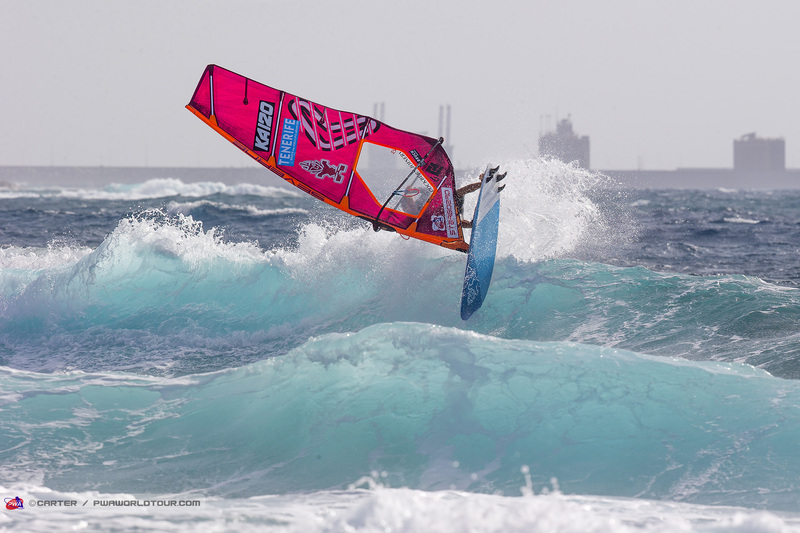 Köster looked a little bit out of sorts for him in Heat 22 against Campello as the 4-time world champion really struggled on the wave, while Browne came out on the wrong side of an enthralling battle against Jaeger Stone. However, there are couple of different faces currently in joint 5th. Firstly, the exciting youthful talent of Marc Paré (Simmer / Simmer Sails), who breaks into the top 5 for the first time in his career, which guarantees the 20-year-old his best result yet. 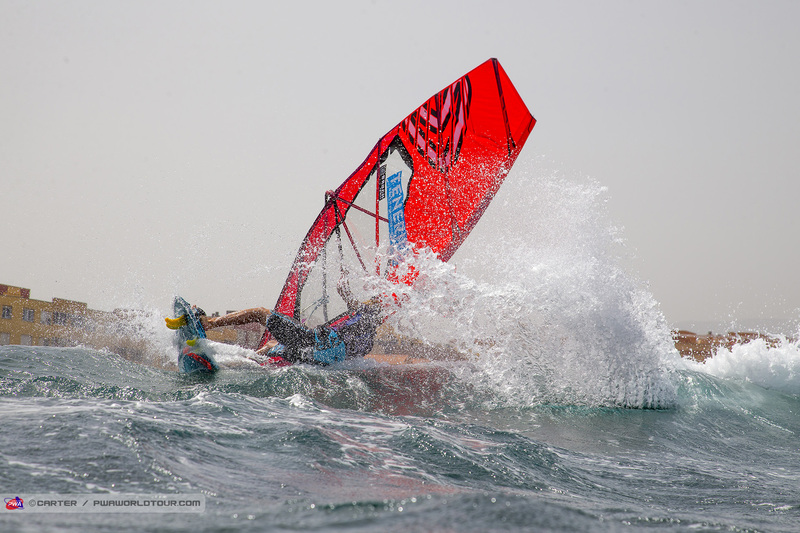 While, Jules Denel equals his best performance in a single elimination after recording an impressive victory against Alex Mussolini (RRD / RRD Sails) with several powerful gouges. Denel is now guaranteed his first top 10 result since 2016. The top ten is currently completed by Thomas Traversa (Tabou / GA Sails), Julian Salmonn (Bruch Board / Gun Sails), who was only denied a spot in the top 5 by Browne producing a buzzer beater, Leon Jamaer (JP / NeilPryde), Josep Pons (Simmer / Simmer Sails), Klaas Voget (Fanatic / Duotone), Moritz Mauch (Severne / Severne Sails), Dany Bruch (Bruch Boards / Flight Sails / AL360) and Alex Mussolini. Shortly after the completion of the Single Elimination, the Men’s Double Elimination began and at the close of play the opening two rounds have been completed. Robby Swift (JP / NeilPryde / SWOX) is a surprise name to see in the first round of the double, but he is safely through the first two rounds after defeating Flo Jung (Starboard / GunSails), which sees him into joint 17th where he will face Moritz Mauch. Meanwhile, Arthur Arutkin (Fanatic / Duotone) is also through after defeating teammate - Alexandre Grand-Guillot (Fanatic / Duotone) - before edging a close battle against Morgan Noireaux (JP / S2Maui). 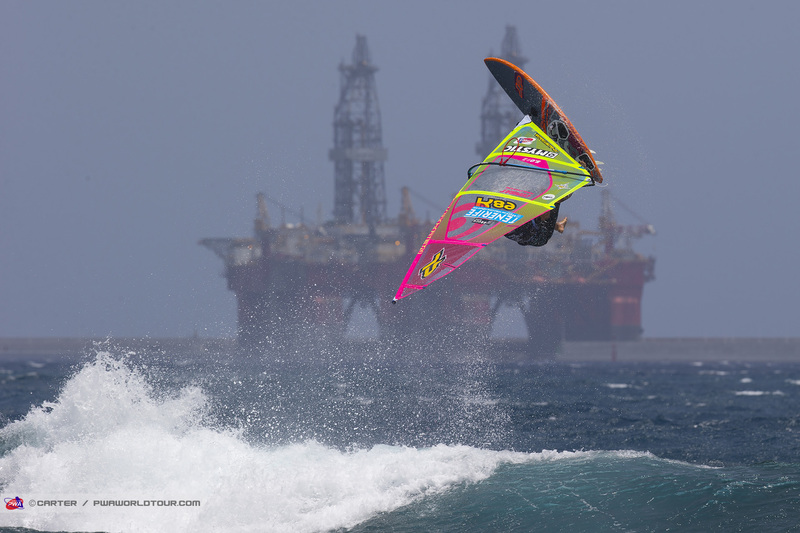 Both men impressed with their dynamic wave riding, but Arutkin progressed after landing a clean one-handed backloop. 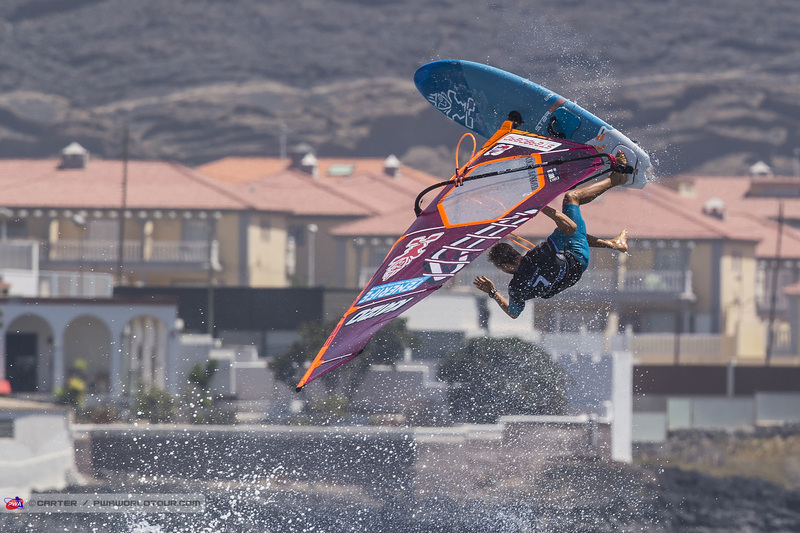 Dieter van der Eyken (Severne / Severne Sails) is also into the 3rd round after a couple of assured performance, while 15-year-old Marino Gil (Goya Windsurfing) also won his first two heats and will now face Klaas Voget (Fanatic / Duotone). Elsewhere, Omar Sanchez (Carbon Art / KA Sails) looked in excellent form - impressing with stylish one-handed backloops, frontside airs and vert snaps to set up a tie against Josep Pons (Simmer / Simmer Sails). Meanwhile, Gollito Estredo (Fanatic / Duotone) has been one of the standouts of the Double Elimination so far, landing at least one, almost perfect double forward in each heat, while looking dangerous on the wave and he could pose a few problems for Alex Mussolini next. 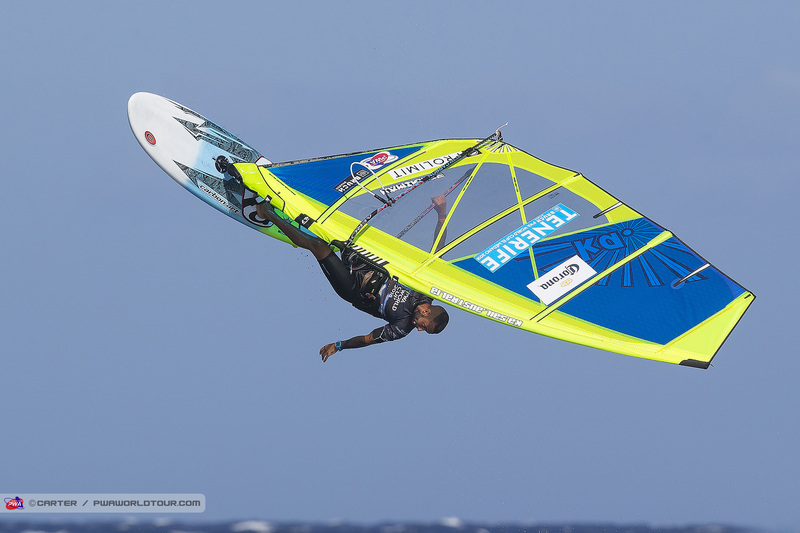 Antoine Martin (NeilPryde) was disappointed to be knocked out in the second round of the Single Elimination, but started to make amends for that today with two solid performances to defeat Takuma Sugi (Tabou / GA Sails) and Loick Lesauvage (Goya Windsurfing), who didn’t have a good heat. Martin is safely into joint 17th as it fellow Guadalupean - Camille Juban (Quatro / Simmer), who looked stylish tweaking frontside airs. The forecast for tomorrow is for slightly less wind, but there should still be enough wind and waves to continue to make progress through the double eliminations. The sailors will meet again at 9am tomorrow morning with the action commencing from 9:30am (GMT+1) onwards. Ich glaube, das ist bis jetzt sehr umplanmäßig für Philip. Er ist nur 5. geworden, Victor Fernandez mindestens 2. Klar, nach der Single. Aber er kann noch verdrängt werden auf den 2. Die Top 4 kann sich noch ändern, also alles vor Philip Köster. Ich kann mir auch nicht vorstellen, dass er mit dem Ergebnis noch Weltmeister werden kann dies Jahr. 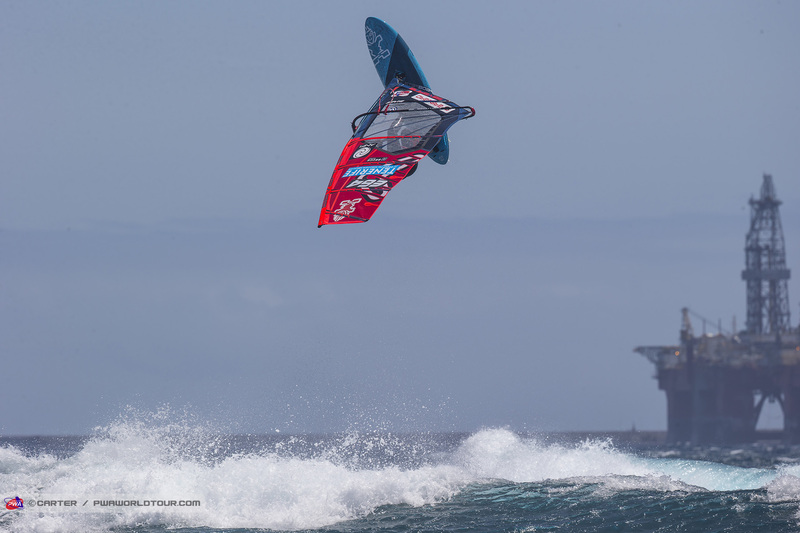 El Cabezo showed several different sides to itself today on the penultimate day of the 2018 Tenerife PWA World Cup as wave size and quality plus the wind strength varied quite frequently with the passing clouds. The forecast may have been more marginal today, when compared to yesterday, but a further 6 hours of competition were completed as the Men’s Double Elimination was whittled down to the last 4 sailors, while the first 4 Women’s Heats were also finished heading into the final day. The opening two rounds of the Women’s Double Elimination were completed during the early evening and so far Nicole Bandini (Fanatic / Duotone) has made the most progress by winning both of her opening heats against Nuage Le Derff (Hot Sails Maui) and Sarah Hilder (Simmer / Simmer Sails) and will now face Arrianne Aukes (Fanatic / Duotone / Maui Ultra Fins). 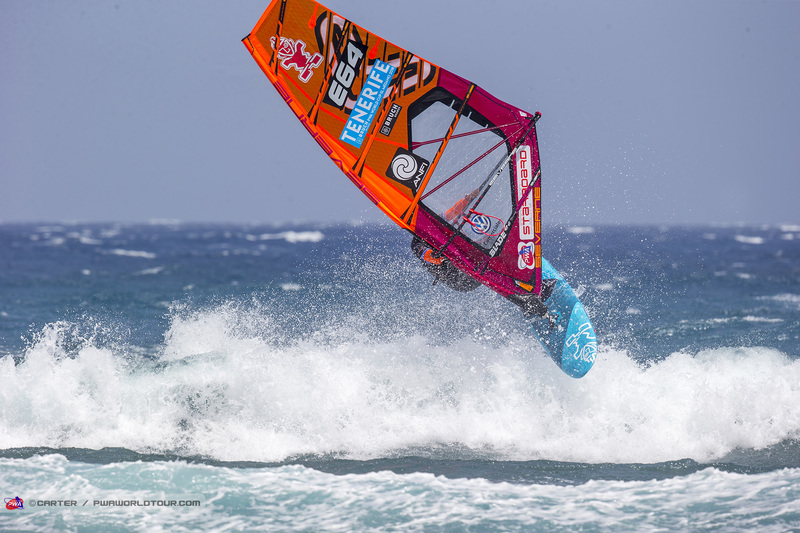 Meanwhile, Maaike Huvermann (Starboard / Severne / Maui Ultra Fins) produced a solid performance in Heat 26b with a stalled forward, clean backloop and a couple of decent waves to set up a tie against Lina Erpenstein (Severne / Severne Sails). 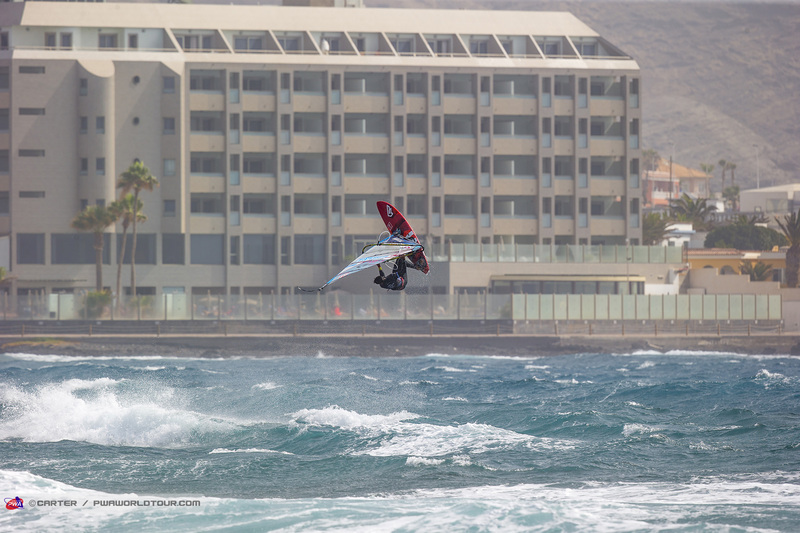 The big news of the day is that the World No.1 & No.2 coming into Tenerife - Philip Köster (Starboard / Severne / Maui Ultra Fins) and Marcilio Browne (Goya Windsurfing) - are both out of the double elimination in 5th and 6th place respectively and there are now only the top 4 men left standing - Victor Fernandez (Fanatic / Duotone / Shamal Sunglasses), Adam Lewis (Fanatic / Duotone / SWOX), Ricardo Campello (Brunotti Boards / Point-7) and Jaeger Stone (Starboard / Severne Sails / SWOX / Shamal Sunglasses). 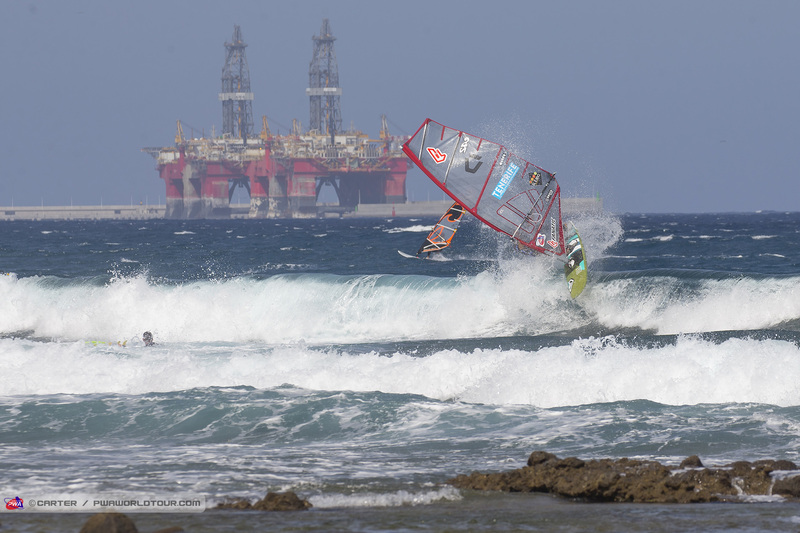 As things stand Victor Fernandez would shoot to the top of the overall rankings - from 4th overall before the event - if he can defend his single, but Ricardo Campello could still come back to take control of the title race, if there are conditions, and the 33-year-old can come back to win the double elimination. Jaeger Stone and Philip Köster both agreed that they were happy to sail Heat 48 and after a close tussle the Australian just came out on top. Stone racked up his best wave of the heat with his final effort as he landed a taka after blowing the fins out. The result may have been different if Köster could’ve hung onto his double forward effort, but the 4-time world champion couldn’t quite sail away and that may be the end of his title aspirations for this season. Meanwhile, Stone will now face Ricardo Campello in a rematch of the single elimination to decide 3rd and 4th place - with the winner then facing Adam Lewis. Like Köster, Marcilio Browne’s title chances may also be over for another season after losing out to Köster in a massive heat in Heat 47. The Brazilian had looked more dangerous in his two prior heats today than in the single elimination as he defeated Leon Jamaer (JP / NeilPryde) and Omar Sanchez (Carbon Art / KA Sail), but was then dealt a tough blow against the German, as Browne was left to desperately pump into a couple of underpowered backloop attempts without success, while Köster was able to land a trademark double and with no counting jump Browne was left no chance. 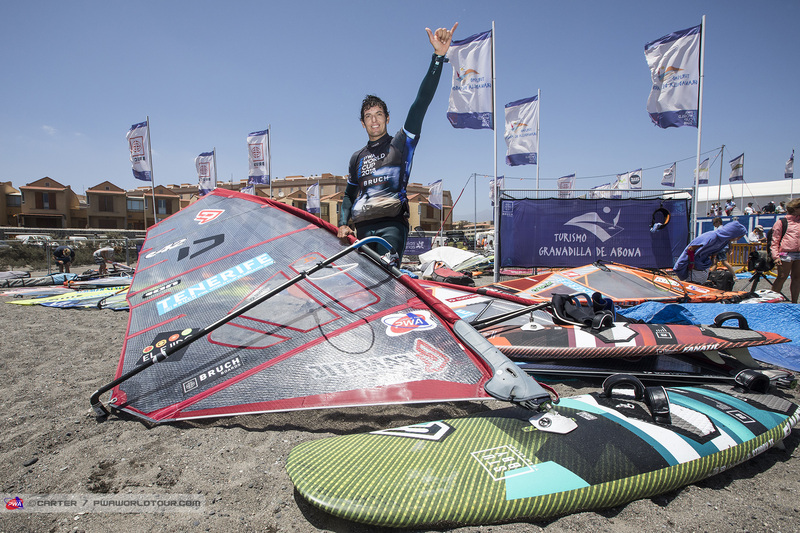 Omar Sanchez (Carbon Art / KA Sail) was the comeback king in the double elimination at the Spaniard won 5 consecutive heats to earn his best result yet on the world tour - 7th. The 27-year-old took down Antoine Albert (Goya Windsurfing) and Dario Ojeda (Flikka / Challenger Sails) yesterday, while receiving a bye through Heat 40a - with Josep Pons (Simmer / Simmer Sails) having to retire after needing 17 stitches in his foot after his foot came out of the footstrap during a double forward - but Sanchez then claimed a hugely impressive victory over Alex Mussolini (RRD / RRD Sails) before also defeating Marc Paré (Simmer / Simmer Sails) - who slips from 5th in the single to 9th in the double. Sanchez’s defeat of Mussolini has to go down as the upset of the day and Mussolini will not be happy to have finished 13th - especially given the fact that the Spaniard had not finished outside of the top 10 here since 2011 and has earned 3 podiums here during that time. Elsewhere, Robby Swift (JP / NeilPryde / SWOX) produced a series of impressive displays to come back from the first round of the double to finish joint 9th for the event. The Brit earned the highest scoring wave of the day - 8.73 points - after landing a sick frontside 360 against Moritz Mauch (Severne / Severne Sails) in Heat 38a before denying Julian Salmonn (Bruch Boards / Gun Sails) his first top 10 finish. Swift then pushed Philip Köster all the way in Heat 44a but just fell short by less than a point. 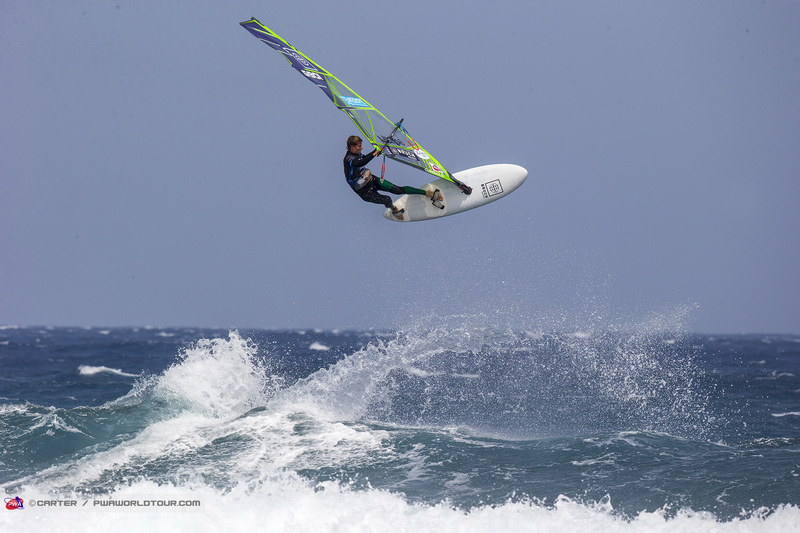 Dieter van der Eyken (Severne / Severne Sails) also rattled his way back through the double elimination to secure back-to-back top ten finishes to start the season - 9th here and in Pozo. 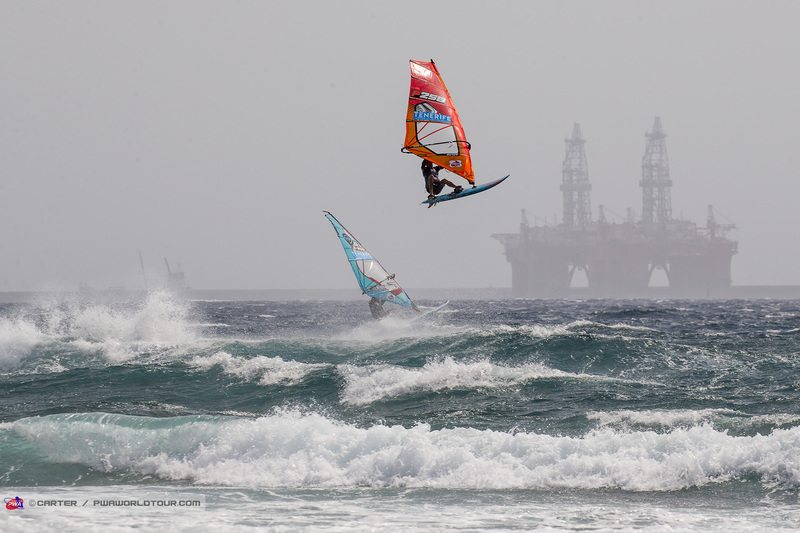 The Belgian was in fine form today, which saw him earn a clearcut victory against - Thomas Traversa (Tabou / GA Sails) - as he finished the heat with two waves in the excellent range - 8 and 8.25 points to cause an upset. van der Eyken then ended the hopes of Klaas Voget (Fanatic / Duotone) before Jules Denel (JP / NeilPryde) ended his comeback - meaning Denel finishes 7th for the event after losing out to an on form Philip Köster. Elsewhere, Leon Jamaer (JP / NeilPryde) records his first top ten finish of the season - 9th - after missing out in Pozo. 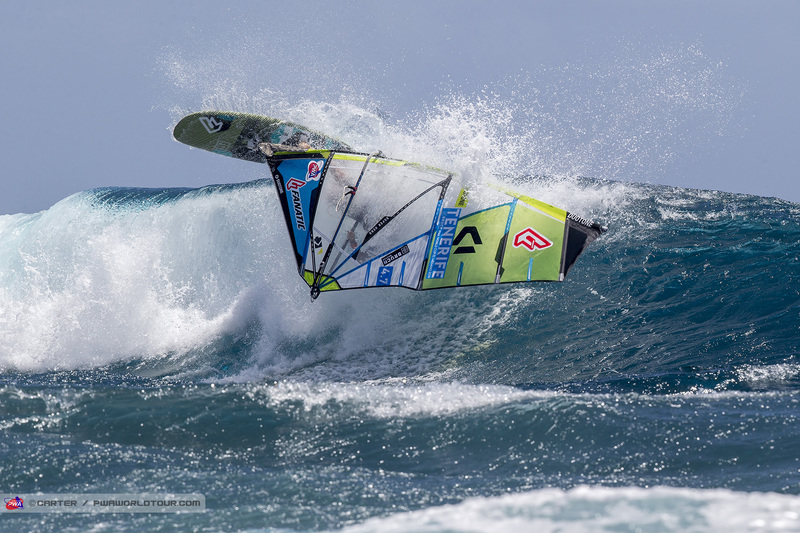 The German impressed today with his powerful wave riding as he knocked out Camille Juban (Quatro / Simmer Sails) and Dany Bruch (Bruch Boards / Flight Sails / AL360) before Marcilio Browne eliminated him. The forecast for tomorrow is for slightly lighter winds and similar waves, so there is a distinct possibility that we will be able to finish the double eliminations. However, that decision will become apparent tomorrow morning - the skippers’ meeting for which has been called 10am with the action commencing from 10:30am (GMT+1) onwards. 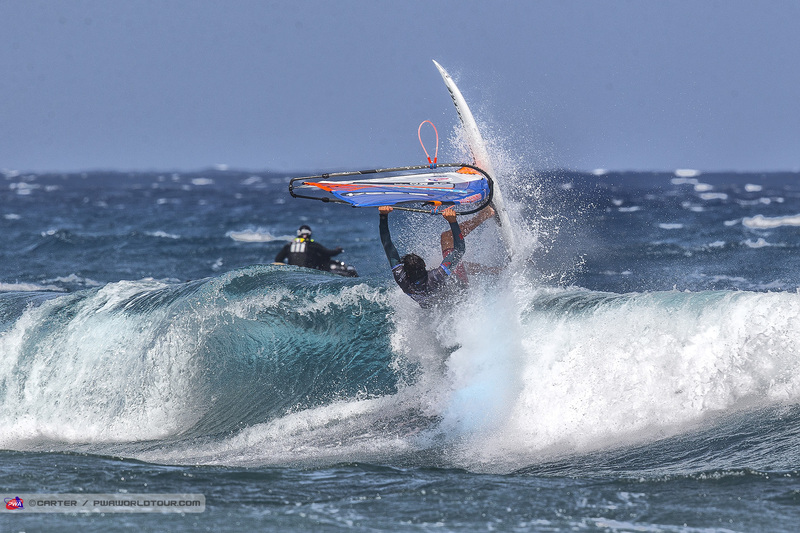 The final day of the 2018 Tenerife PWA World Cup saw lighter winds but solid waves, which allowed the final few heats of the Men’s Double Elimination completed, while unfortunately the conditions deteriorated with only 4 girls left standing in the Women’s Double Elimination - meaning the podium remains unchanged. At the end of the event, it is Iballa Moreno (Starboard / Severne / Maui Ultra Fins) and Victor Fernandez (Fanatic / Duotone / Shamal Sunglasses), who walk away with the top honours, which means both of them lead the respective world title races with one event to go. 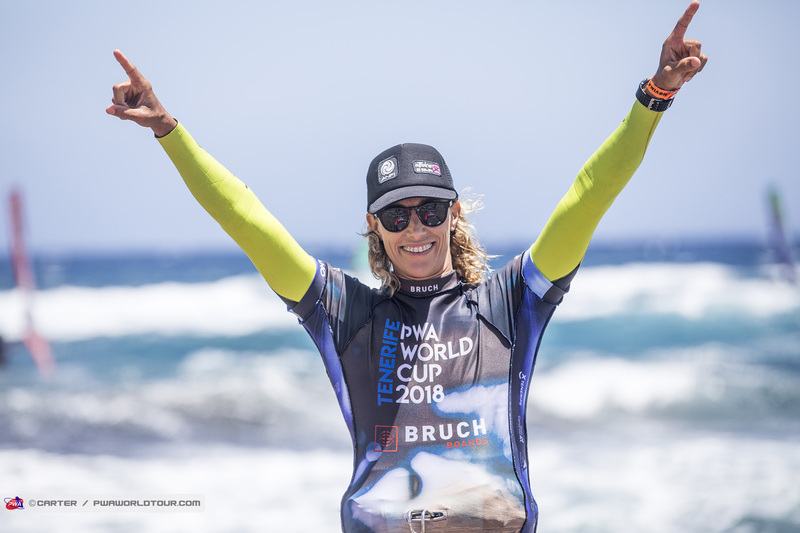 With it not quite being possible to complete the Women’s Double Elimination - Iballa Moreno (Starboard / Severne / Maui Ultra Fins) - walks away from the 2018 Tenerife PWA World Cup as the champion having won the Single Elimination ahead of Sarah-Quita Offringa (Starboard / NeilPryde / Maui Ultra Fins), which means the reigning world champion completes a brilliant hat-trick of event victories here. Iballa’s second victory of the season also sees her take the outright title race lead with one event to go. With the Double Elimination only getting to Heat 32 that means that Sarah-Quita Offringa and Daida Moreno (Starboard / Severne / Maui Ultra Fins) remain in an unchanged second and third place from the Single Elimination, which means Offringa will head into Sylt ranked 2nd in the World. 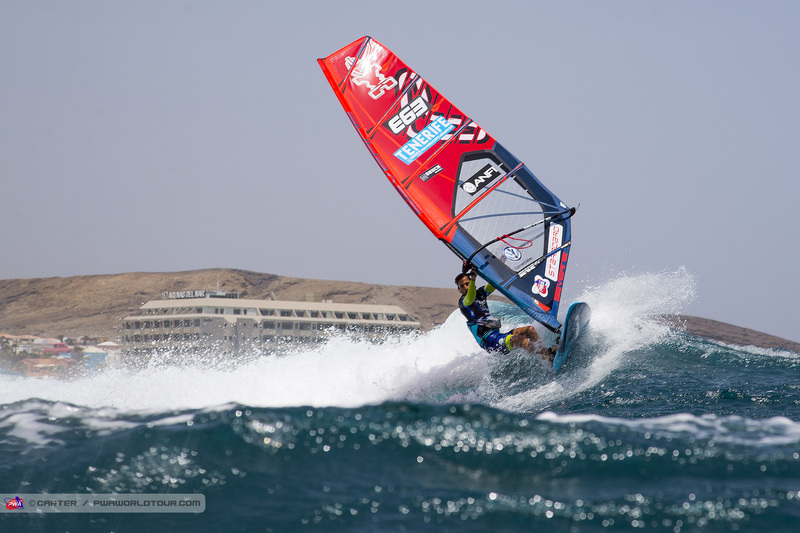 Elsewhere, Justyna Sniady (Simmer / Simmer Sails / AL360) brought Lina Erpenstein’s (Severne / Severne Sails) come back to an end to successfully defend her 4th place from the Single Elimination, while earning her best result of the season. The Pole was upset that she wasn’t given the opportunity to fight further, but with the wind remaining light on the final evening, the contest was called off at 5pm. 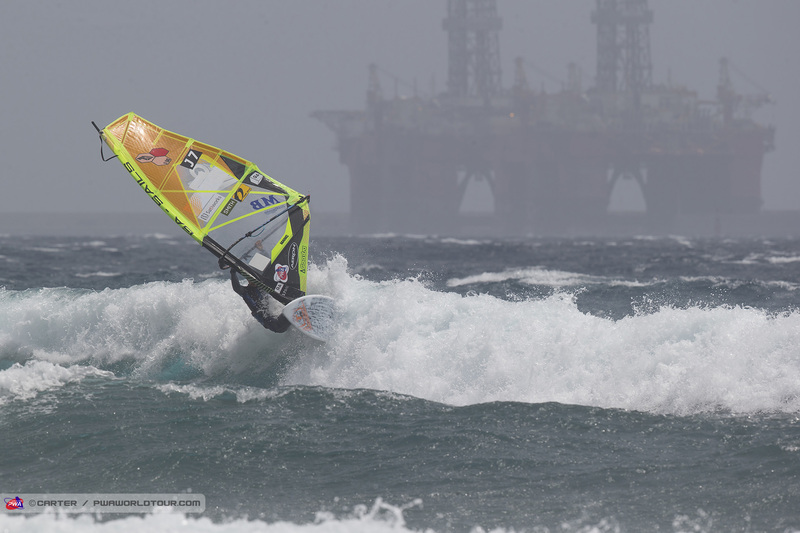 Erpenstein, meanwhile, was able to win 3 heats in the Double Elimination with the German’s wave riding in the light winds impressing the judges with her powerful approach. Erpenstein was able to defeat Maaike Huvermann (Starboard / Severne / Maui Ultra Fins) and Arrianne Aukes (Fanatic / Duotone / Maui Ultra Fins) before producing a buzzer beater against good friend Steffi Wahl (Sailloft Hamburg) to move into 5th place. The 21-year-old also earned the highest scoring wave of the day - 8.88 points. Steffi Wahl was disappointed to be scored 6.75 points for her vert, late hit against Erpenstein, but the German should be pleased with how she sailed today - although she may not have been happy to finish 6th - Wahl delivered some of the highest risk, late hits of the day. Victor Fernandez (Fanatic / Duotone / Shamal Sunglasses) successfully defended his single elimination crown by defeating Jaeger Stone (Starboard / Severne / SWOX / Shamal Sunglasses), which means Fernandez shoots to the top of the overall rankings. The Spaniard immediately placed Stone under pressure by landing a massive double forward, which was made even more impressive given the lighter winds, to earn 8.45 points. And from there the two-time world champion never looked back and will now head into Sylt with destiny in his own hands as he bids to win world title No.3. Jaeger Stone fought his way back from 4th in the Single Elimination to 2nd today as he firstly defeated Ricardo Campello (Brunotti Boards / Point-7) with a big and stylish one-hand, one-foot backloop, while looking in sync with the waves and consistently blowing out the fins. Having defeated Campello, Stone then produced the highest scoring heat of the day in Heat 50 against Adam Lewis (Fanatic / Duotone / SWOX) - 20.56 points - as the Australian landed a massive one-hand, one-foot backloop while looking extremely calm and relaxed - almost looking like he was free sailing at times such was his flow at that stage. Stone earned wave scores of 7.62 and 6.12 points - linking vertical stylish turns with a taka to take down the Brit and move into 2nd place. During those couple of heats Stone looked like he couldn’t put a foot wrong, but with the tide and conditions changing he couldn’t quite sustain that level of performance against Fernandez. Stone will still be happy to have earned his first podium since Sylt 2016. 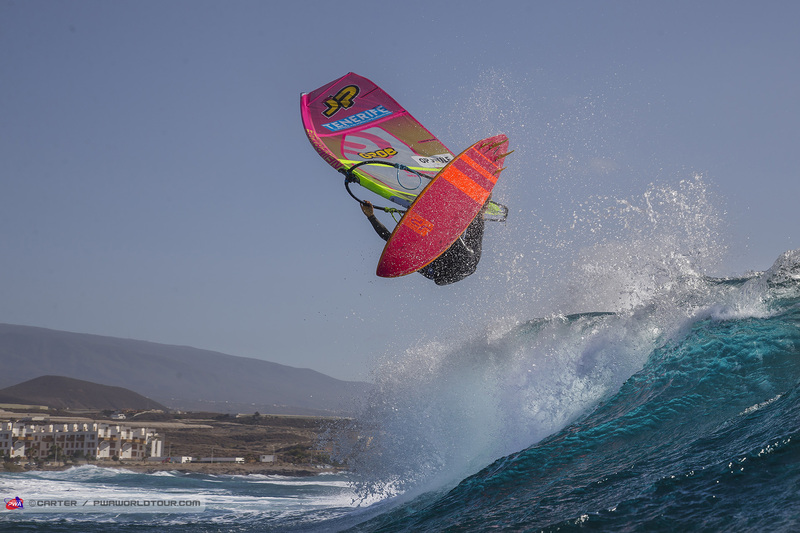 Adam Lewis may fall one place from the Single Elimination to 3rd, but will still be delighted with earning his first podium on the PWA Wave World Tour. Against Stone, Lewis made a slow start and seemed to be a bit out of sync with the waves. And unfortunately, by the time the Brit had started to show the form that had got him into the Single Elimination Final, it was too late for him to overturn the result against an on fire Stone. Ricardo Campello desperately hunted for the double forward in Heat 49 against Stone, but despite numerous efforts, he simply didn’t have enough power for the second rotation and landed several single forward loops by sheeting out and showing the immense control he has. However, he bows out in 4th here. With the wind failing to improve the Women’s contest was officially called off at 5pm. The prize giving ceremony will be held at 8pm (GMT+1) tonight. Congratulations to all the winners. We’ll be back on Monday with an event summary. 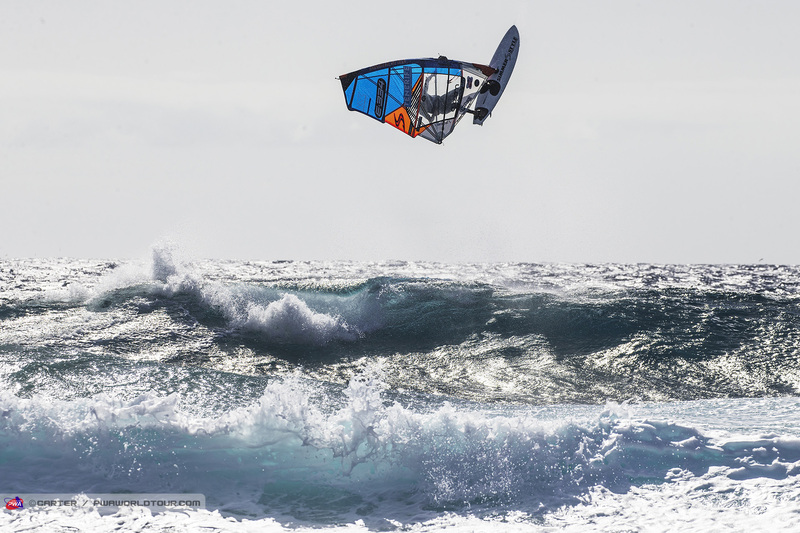 El Médano, Tenerife, continues to prove itself as one of the best and most consistent wave sailing spots in Europe as results were gained in all categories for the 2018 Tenerife PWA World Cup - sponsored by Bruch Boards - which means Tenerife maintains its 100% record since 2011. Over the course of the week El Cabezo showed numerous sides to itself to give the best wave sailors in the world the biggest challenge it could and at the end of an intense week it is Iballa Moreno (Starboard / Severne / Maui Ultra Fins) and Victor Fernandez (Fanatic / Duotone / Shamal Sunglasses) that walk away with those all important victories and both now head up the overall rankings in the Women’s and Men’s, respectively. 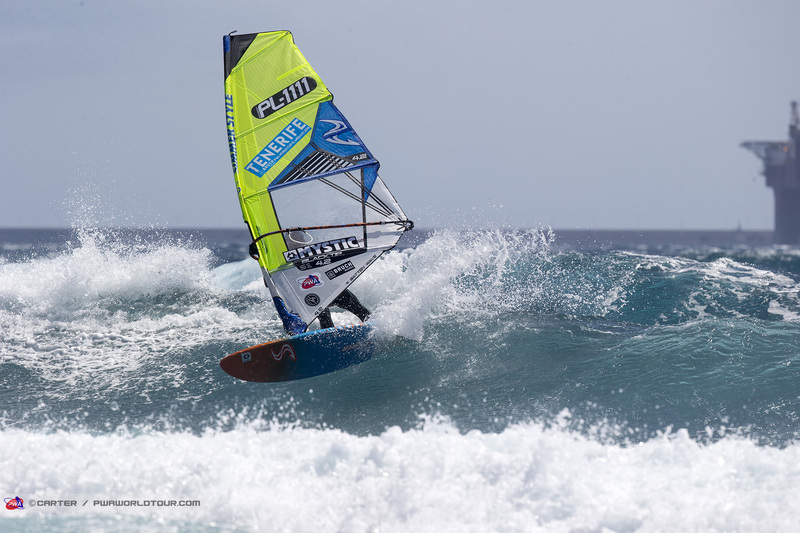 Iballa Moreno (Starboard / Severne / Maui Ultra Fins) continued her fine record in Tenerife as the reigning world champion claimed victory in the single elimination to complete a superb hat-trick of event victories here. 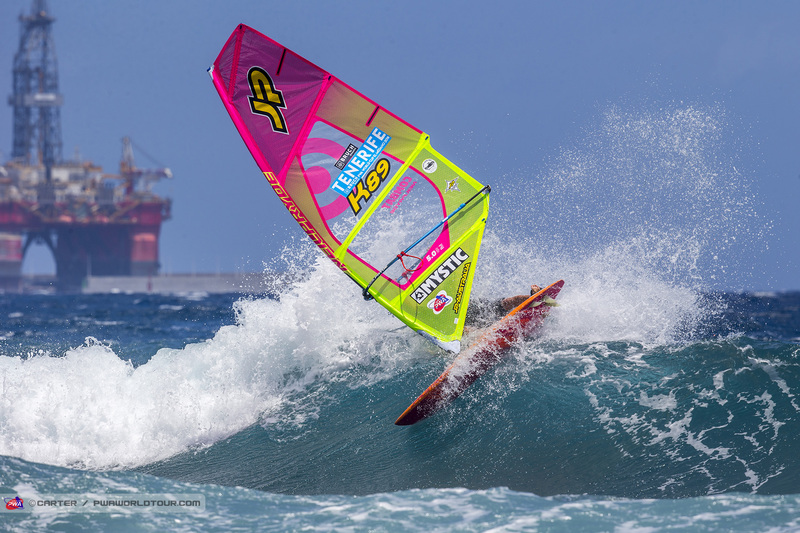 Iballa impressed by landing big backloops, while her wave riding was back on point and she now has destiny in her own hands as she aims for her 5th consecutive world crown. 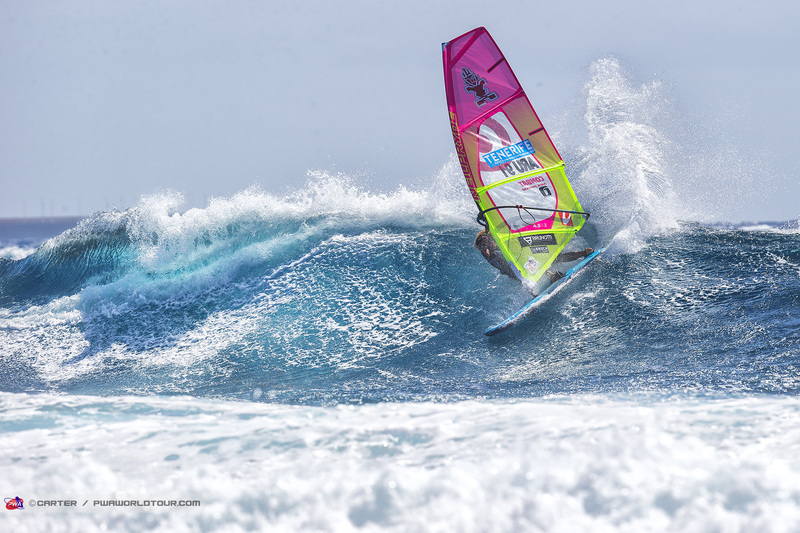 Sarah-Quita Offringa (Starboard / NeilPryde / Maui Ultra Fins) has proven that she has taken her wave sailing to a new level this year by recording her 3rd straight second place of the season, which keeps Offringa on course to break into the overall top 2 for the first time in her wave career. Offringa consistently landed tweaked pushloops, while impressing with her powerful approach to wave riding. 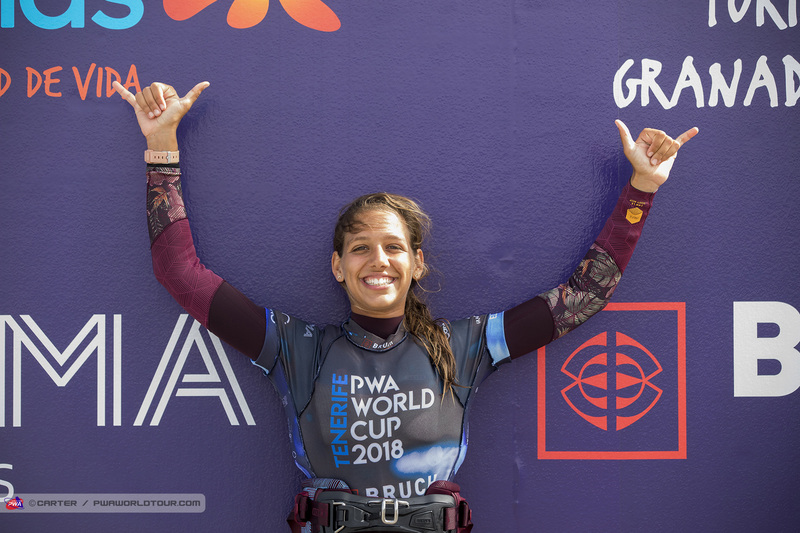 Despite Offringa being ultra consistent this year a maiden wave world title is out of the Aruban’s reach for 2018 with Iballa’s two victories making her uncatchable. The only person who can now stop Iballa is her sister Daida Moreno (Starboard / Severne / Maui Ultra Fins) and in order for Daida to deny Iballa she would need to win the final event of the year in Sylt, while also requiring Iballa to finish 3rd or worse. Third place here for Daida definitely wouldn’t have been what the multiple-time world champion was looking for, but she is still in the hunt for her first title since 2013. 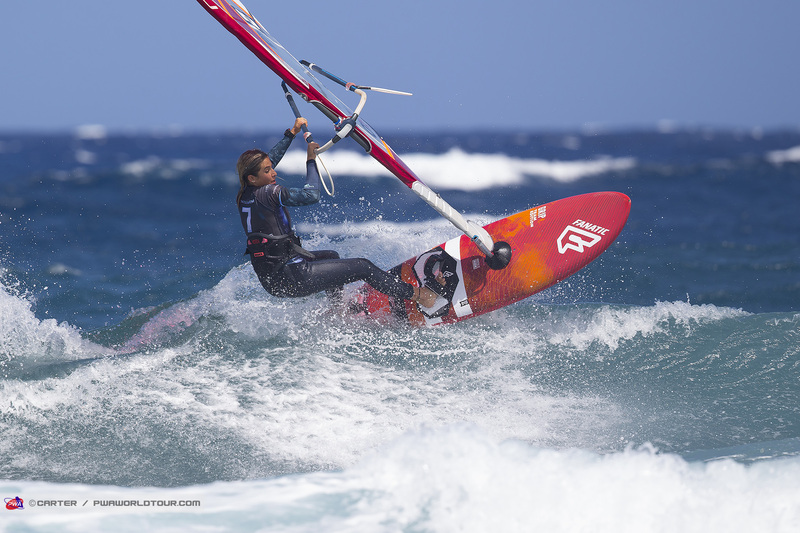 Elsewhere, Justyna Sniady (Simmer / Simmer Sails / AL360) successfully defender her 4th place from the Single Elimination to record her best result of the season after she reversed the tables from Pozo against Lina Erpenstein (Severne / Severne Sails). 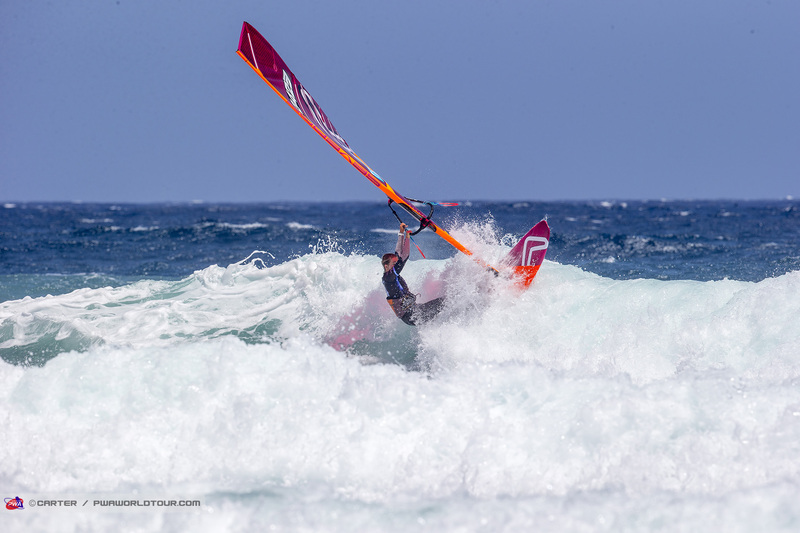 Sniady landed some of her biggest backloops in a competition to date, while looking consistent on the wave and she will now be looking forward to Sylt as she aims to better or equal last year’s overall performance - 5th. Lina Erpenstein finishes outside the top 4 for the first time this season - 5th - which keeps the German 4th in the overall rankings with one event to go. The 21-year-old couldn’t always find the jumps she needed this time around, but she really caught the eye with her wave riding as she continues to progress. Steffi Wahl may be a little disappointed to have finished 6th in the end. The German was just seconds away from defeating Erpenstein in the battle for 5th and 6th, but her good friend produced a buzzer beater to end her chances for another year. However, as usual, Wahl impressed with her wave riding as she consistently produced several vert, late hits. 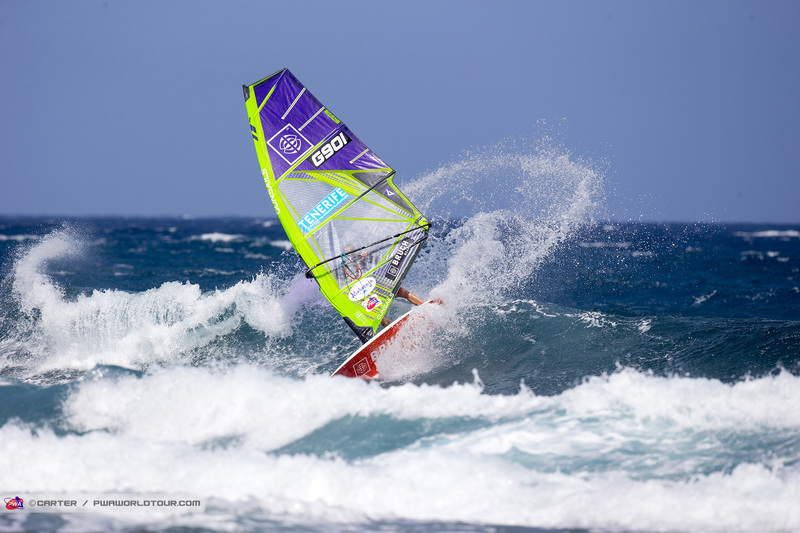 Meanwhile, Arrianne Aukes (Fanatic / Duotone / Maui Ultra Fins) remains 5th in the overall rankings after finishing join 7th here Tenerife alongside Ulrike Hölzl (Goya Windsurfing. Aukes produced some of her best heats to date but will have a tough battle on her hands to keep 5th place with Justyna Sniady being her biggest threat. 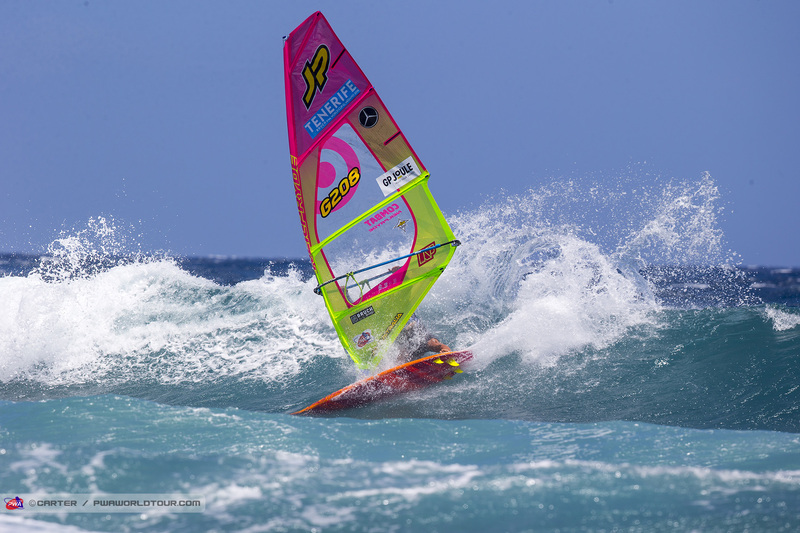 Elsewhere, Maaike Huvermann (Starboard / Severne / Maui Ultra Fins) showed again that with a little bit more training she could soon become a real threat on the PWA Wave World Tour. The Women’s Freestyle Vice-World Champion is already landing stalled forwards and clean backloops while showing she has bags of potential when it comes to wave riding. At the start of the week if you’d have told Victor Fernandez (Fanatic / Duotone / Shamal Sunglasses) that he would lead the title race heading into Sylt, then the Spaniard probably wouldn’t have believed you having finished 4th Pozo Izquierdo. 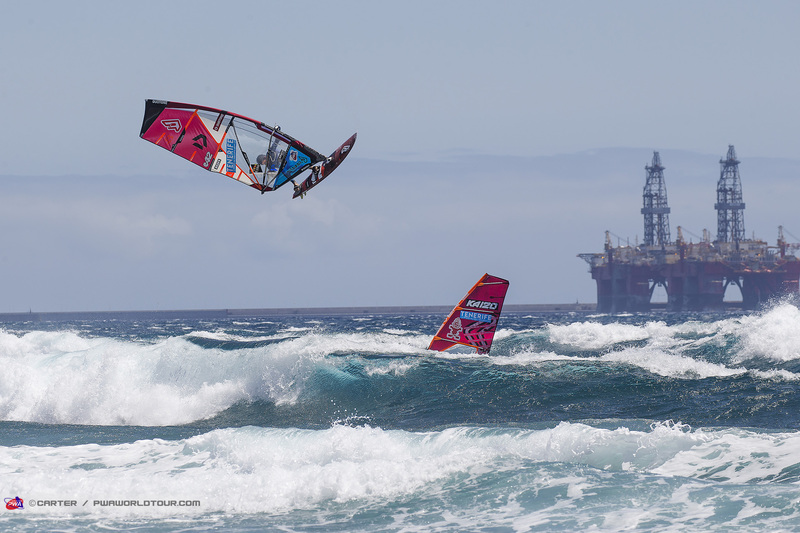 However, with all 3 of the then top 3 coming into Tenerife - Philip Köster (Starboard / Severne / Maui Ultra Fins) - 5th - Marcilio Browne (Goya Windsurfing) - 6th - and Ricardo Campello (Brunotti Boards / Point-7) - 4th - all faltering slightly, Fernandez seizes initiative of the title race after bouncing back in the best way possible by claiming his first victory of the season - which is also the two-time world champions 3rd victory here in the last 4 years. In terms of the title race, it now looks like a two-horse race between Victor Fernandez and reigning world champion Philip Köster - with whoever beating who in Sylt likely to walk away from 2018 as the world champion. 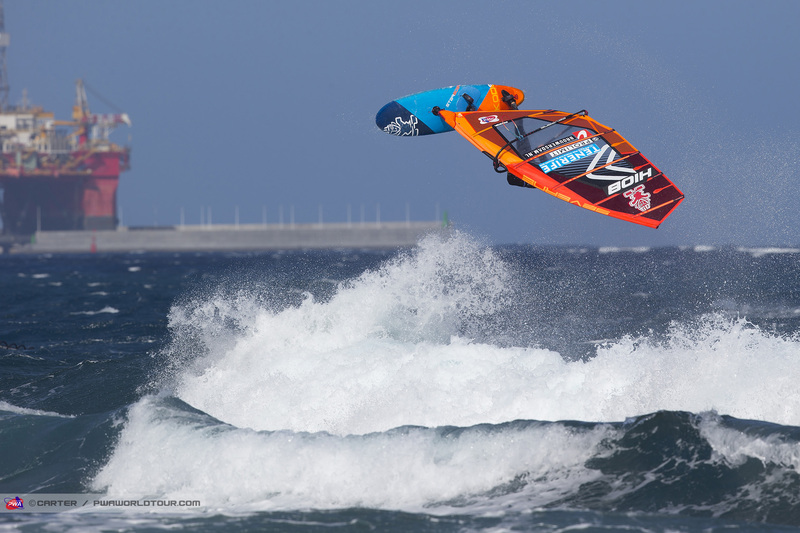 However, Ricardo Campello does still have an outside chance of winning a first wave world title, but in order to do so, Campello would need to win the event while both Fernandez and Köster would have to finish 3rd or worse. 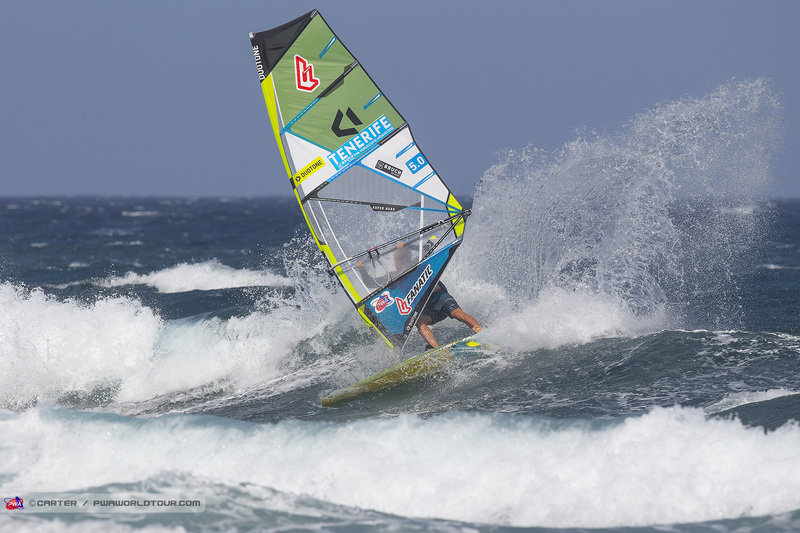 Jaeger Stone (Starboard / Severne / SWOX / Shamal Sunglasses) fought his way back in the Double Elimination to claim his first podium finish since Sylt in 2016. 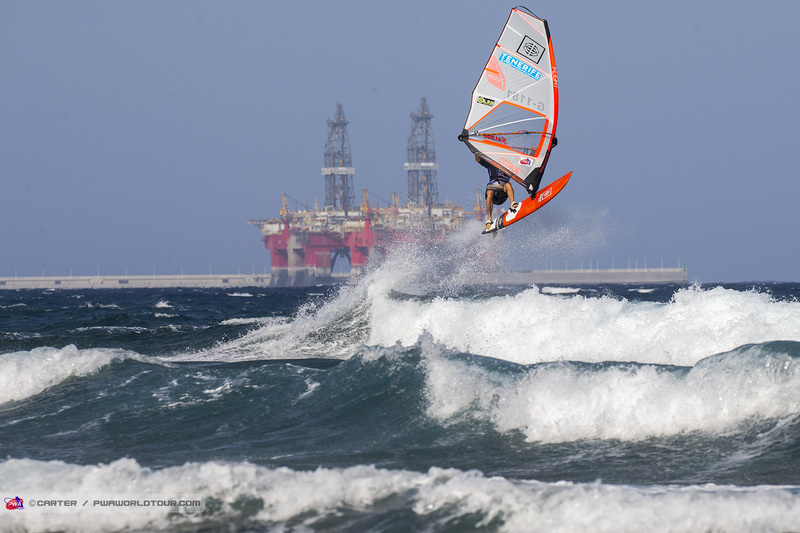 On his way to 2nd place Stone first brought Philip Köster’s come back to an end before also seeing off Ricardo Campello and Adam Lewis (Fanatic /Duotone / SWOX) with one-hand, one-foot backloops and Stone’s explosive style inflicting the damage. Stone’s 2nd place here sees the Australian rise to joint 4th in the overall standings alongside Marcilio Browne - who finished 6th here. 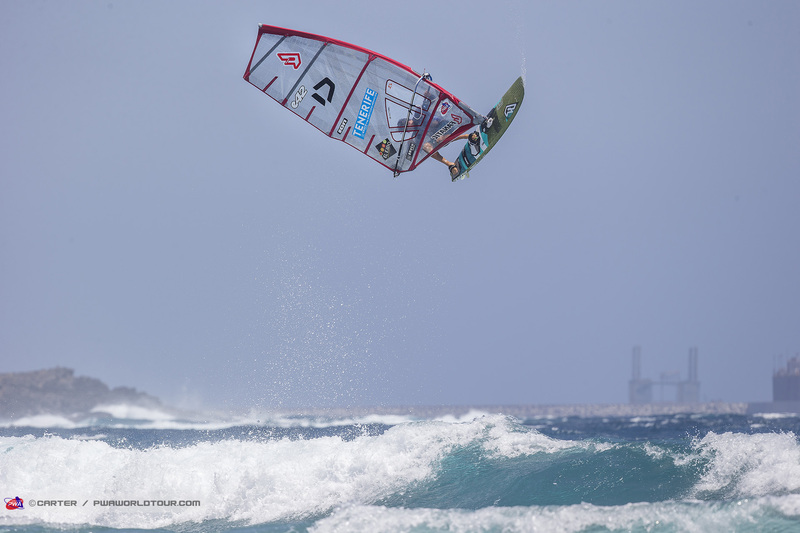 Meanwhile, Adam Lewis walks away from his first podium on the PWA Wave World Tour after producing a brilliant performance with his wave riding, in particular, setting him apart. In the Single Elimination semifinal against Ricardo Campello, Lewis earned the only 10 of the contest, while almost earning a perfect wave score heat after landing sick frontside 3s and demonstrating some of the biggest turns of the competition. 3rd place in Tenerife sees Lewis sitting in 6th place in the overall rankings. Jules Denel (JP / NeilPryde) will be very happy with his week's work after recording his first top 10 finish since 2016 - joint 7th. The Frenchman’s most impressive victory came against local legend Alex Mussolini (RRD / RRD Sails) - who surprisingly only managed a 13th place here, which is the first time Mussolini has finished outside the top 10 here. Sharing 7th place is Omar Sanchez (Carbon Art / KA Sail) after the Spaniard produced the comeback of the Double Elimination, which saw Sanchez win 5 heats on the spin against Antoine Albert (Goya Windsurfing), Dario Ojeda (Flikka / Challenger Sails), Josep Pons (Simmer / Simmer Sails) - who retired from the contest through injury, before completing two impressive victories against Alex Mussolini and Marc Paré (Simmer / Simmer Sails) to earn his best result to date on the world tour. 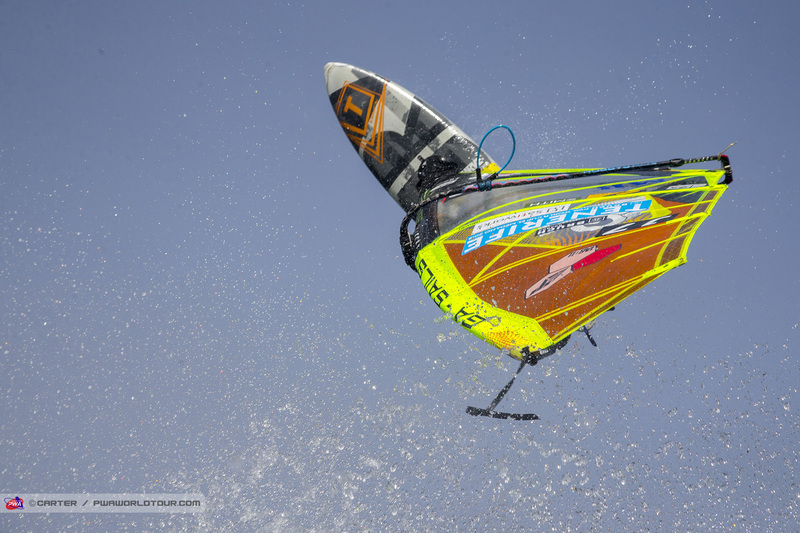 Elsewhere, both Robby Swift (JP / NeilPryde) and Dieter van der Eyken (Severne / Severne Sails) were able to win 4 consecutive heats in the Double Elimination as they fought back into joint 9th for the second contest in a row, which sees them ranked in joint 8th overall alongside Marc Paré. Meanwhile, Leon Jamaer (JP / NeilPryde) secured the final place in the top 10 - also in joint 9th. 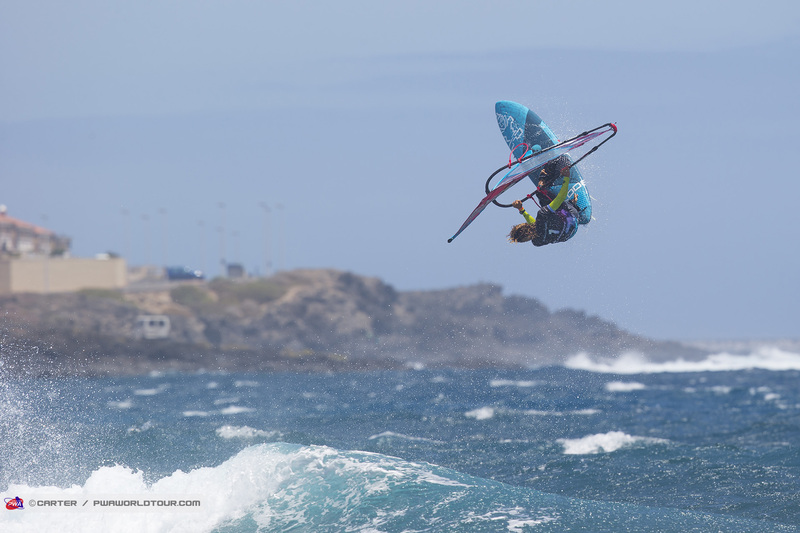 Also a mention for 15-year-old Marino Gil (Goya Windsurfing), who after the first two events is ranked 20th overall having claimed an excellent joint 17th in both Pozo and Tenerife. On Day 2 and 3, the Youth’s also took to the water again and you can find full reports of the action here and here. Congratulations to Alexia Kiefer Quintana (Fanatic / Duotone) - U13 Girl’s Champion - Julia Pasquale (Fanatic / Duotone) - U13 & U20s Champion - Tobias Bjørnaa (Fanatic / Duotone) - U13 Boy’s Champion - Takuma Sugi (Tabou / GA Sails) - U17 Boy’s Champion and Noah Vocker (Fanatic / Duotone / Maui Ultra Fins), who won the U20 Boy’s Division. That concludes the Canaries leg of the tour, so the PWA would like to once again thank Dany Bruch (Bruch Boards / Flight Sails / AL360) and his team for all their hard work - we hope to be back again in 2019. 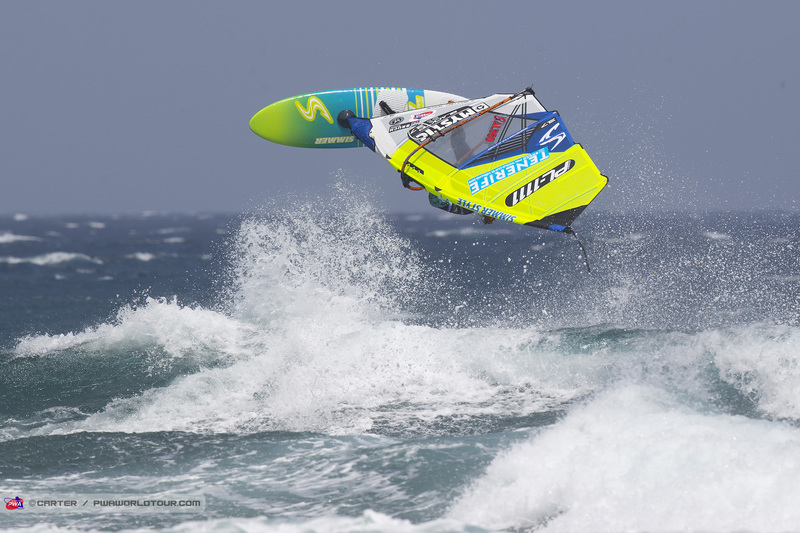 After a busy month in the Canaries, the PWA World Tour now takes a short break until the end of September when we’ll be coming to you live from Sylt, Germany (28th September - 8th October) for the final event of the season and there’s plenty at stake. 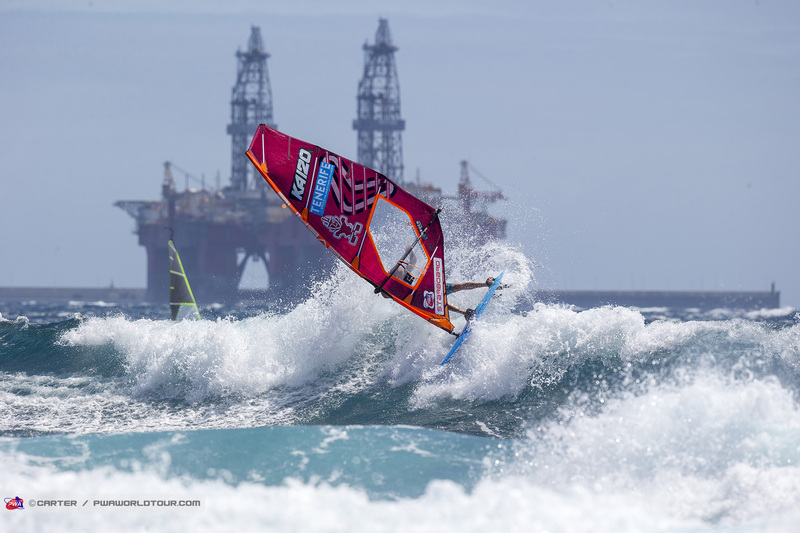 The 2018 Mercedes-Benz PWA Super Grand Slam will see the Men’s and Women’s Wave World titles decided as well as the Men’s Freestyle and Slalom World Championships too. 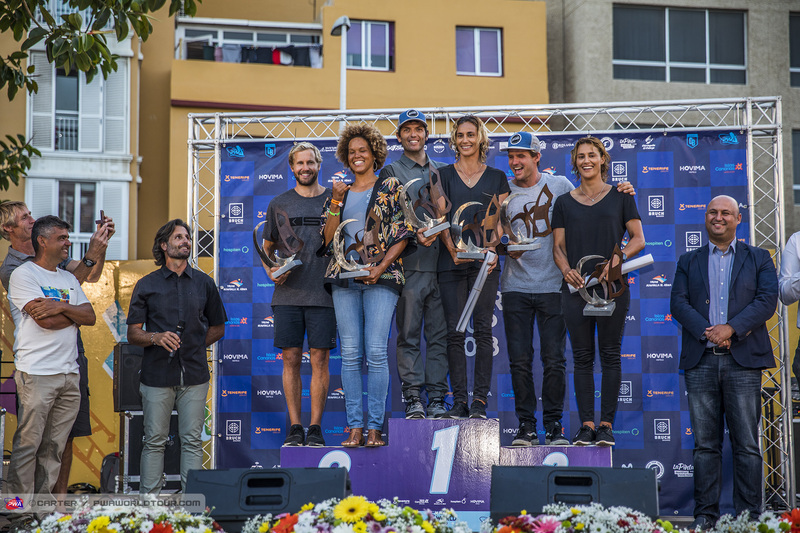 You can revisit everything that happened in Tenerife — including the live stream, elimination ladders, entry list, images and live ticker simply click HERE and scroll to the bottom of the page.